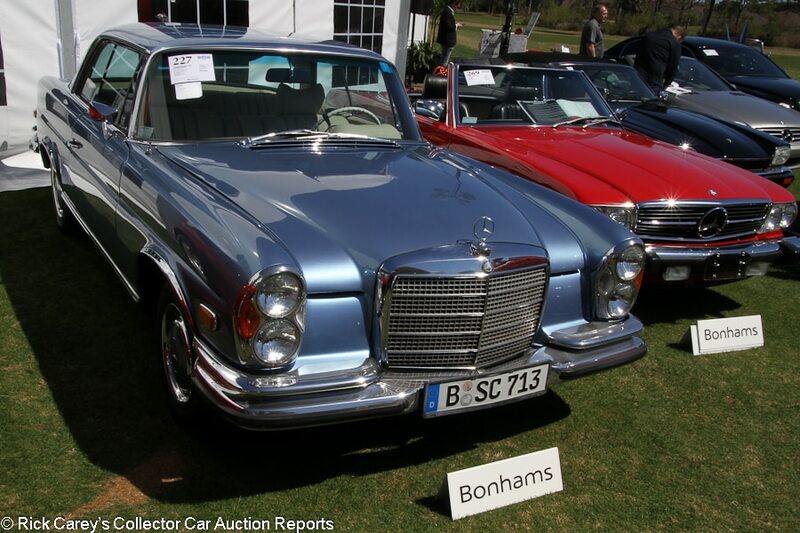 Bonhams auction at the Fernandina Beach Golf Club was very brassy, in the best way possible. 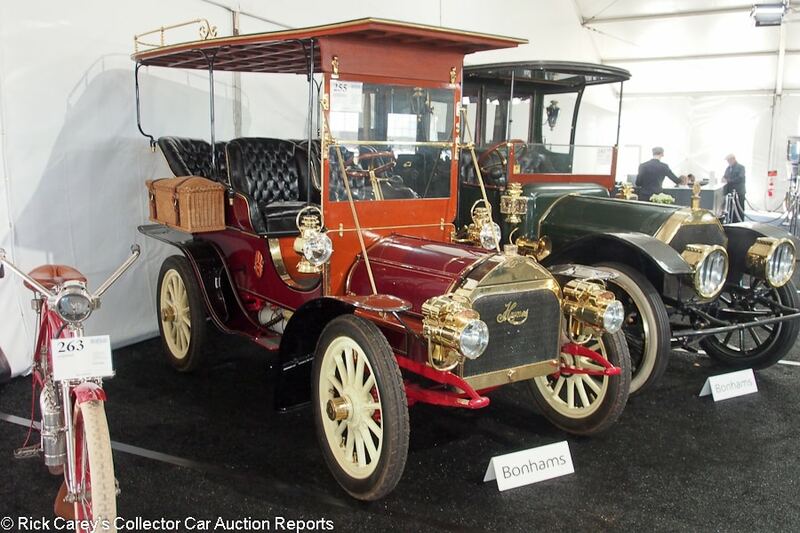 Building on the Don C. Boulton Collection of 28 automobiles, Bonhams presented 27 cars from the Brass Era, 11 even older antiques and a total of 43 lots built before the Wall Street Crash of 1929, 39.8% of the docket. And among the early cars were several with imaginative, ingenious, far-sighted mechanical features that demonstrated the appeal of early cars and that fact that for a period of about a quarter century after Karl Benz first put the motor in the Patent Motorwagen there was no accepted way to build an automobile. Creative inventors came up with their own ideas and proceeded to render them in iron, steel, aluminum, brass and bronze. Don C. Boulton, to judge from the cars in his collection, recognized this creativity. Bonhams astutely added a few other early cars, knowing that the Boulton Collection would seize the attention of anyone with even the slightest interest or curiosity. The auction itself, despite new competition on the other side of Amelia Island Parkway, was a resounding success. 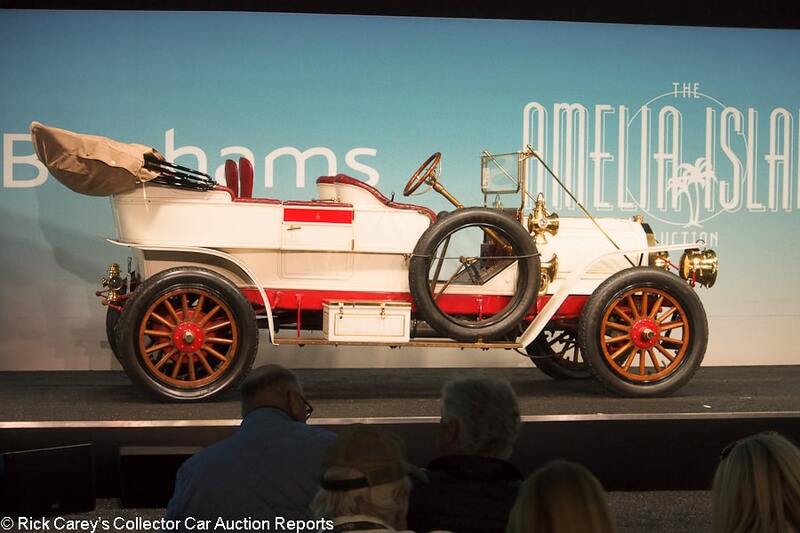 The sale total of almost $16 million was the second highest in Bonhams five years at Amelia despite having only two lots sell at final prices just over $1 million (including commission.) The 2016 sale’s $27.5 million total included one lot at nearly $10 million and two others at just under $3 million. On-site observations are by Rick Carey, Andrew Newton and Greg Ingold. All have been edited by Rick Carey who is solely responsible for the final copy. This report is sorted in lot number order, but to highlight some of the marvelous mechanical wonders a few are pulled out of order and presented upfront in a special section. Owned until 1951 by the family of Louis H. Perlman who used it to demonstrate his revolutionary idea of the demountable rim wheel. Acquired then by Ralph Stein and Henry Austin Clark, Jr. and restored for Stein, a restoration it still wears over half a century later. Tired old paint, chipped and scratched. Worn, creased and occasionally torn old upholstery. Greasy and road grimy engine and chassis. Aged and used but marvelous. Don C. Boulton Collection. 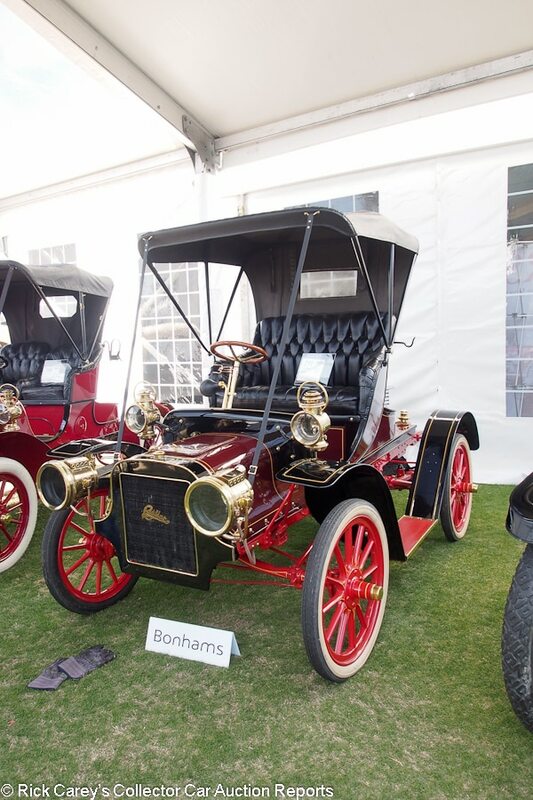 – One of Don C. Boulton’s mechanical marvels, this 1908 Welch incorporated a single overhead camshaft, inclined valves and crossflow porting, well before the Peugeot dohc racers celebrated by the 1914 Peugeot L45 sold by Bonhams 16 months ago from the Lindley Bothwell Collection and proudly displayed on the Amelia Island Concours field Sunday from Jacksonville’s Brumos Collection. The valve gear of the Welch is completely exposed, a visual syncopation when in operation at its sub-1,000 rpm operating speeds. This one has an honorable history of seriously committed early collectors who recognized its advanced thinking, design and execution and brought a deserved superior result. Every Brass collector in the world was at or was watching the Boulton Collection and their passion for this Welch is apparent. 3-speed, Stewart speedometer and clock, bulb horn, Gray & Davis acetylene headlights, kerosene sidelights and taillight, dual spares on the rear deck with a hatbox trunk inside, body color wood spoke wheels, 36×4 1/2 tires, electric starter. – Built up from a Model W engine, chassis and Pope-Hartford fire truck rear axle. Good older paint and upholstery, brass is getting dull. A few edge and other chips but only as appropriate for its age and use. Don C. Boulton Collection. – Opened at 110K and bought here for a realistic price for a realistic, but re-created, example of which only one original Portola Roadster is known to exist, it may not have the lithe quickness of a Mercer Raceabout, but heading down the road it will kick many modern cars into its dust (and oil from the exposed overhead valves’ operation.) It’s another of Don Bouton’s mechanical marvels, a thing of mechanical beauty and early ingenuity that brought an impressive price for a re-creation, but modest money for its endorphins on the road. Lot # 252 1907 Matheson ‘Big Four’ 50hp 7-Passenger Touring, Body after J.M. 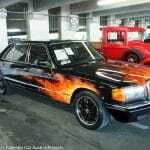 Quimby; S/N 550; Red, Black accent/Black leather; Black leatherette top; Estimate $250,000 – $350,000; Older restoration, 2- condition; With Reserve; Hammered Sold at $190,000 plus commission of 12.00%; Final Price $212,800. – RHD. 490/50 ALAM hp, 3-speed, body color wood spoke wheels, white tires, dual right side spares, Rubes bulb horn, Warner speedometer and clock, Badger Solar acetylene headlights, Neverout generator, Solar kerosene sidelights and taillight, electric starter, side curtains and tonneau cover. – One of four known survivors of the Wilkes-Barre, PA built Matheson with a re-created engine copied from a surviving original. Very good older paint, brass and upholstery from an 80’s restoration. Newer top. Marvelous engine, lightly oiled from use. Don C. Boulton Collection. – The marvelous engine, highly advanced for its period that cued up spectators for the diverse and imaginative Don Bouton Collection’s cars. The exposed camshaft is high mounted on the left side of the engine, operating the overhead valves through roller cam followers (about as big as the rollers on an overhead garage door) and a nest of grease lubricated rocker arms on a single overhead rocker shaft. It has mechanical “make and break” ignition without conventional spark plugs, a source of endless fascination. 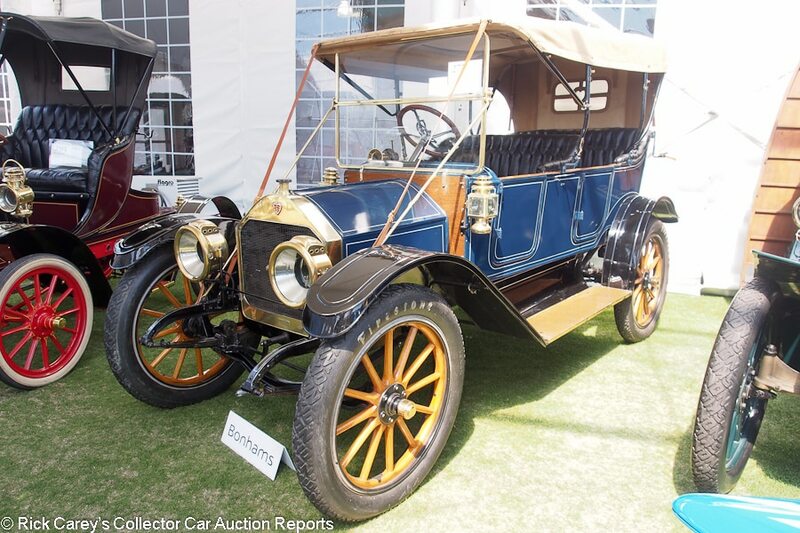 For sale at $180K, it’s largely a re-creation with a built-from-the-whole-cloth engine and replica coachwork, not that anyone should care because it is captivating in its operation, original thinking and execution. Its display in the preview sent onlookers peering under the hoods of the other Don Bouton cars, to their constant amazement and intrigue. Stromberg updraft carburetor, 4-speed, Solar acetylene headlights, kerosene cowl lights and taillight, Neverout acetylene generator, folded trumpet bulb horn, belly pans, double chain drive, single right side spare, whitewall tires, Warner drum speedometer, jump seats, Hill oiler, electric starter. – The only known surviving Tincher. Restored some time ago with high quality paint, brass, upholstery and top on a reproduction body patterned on period photos and an original Tincher catalog which is included. 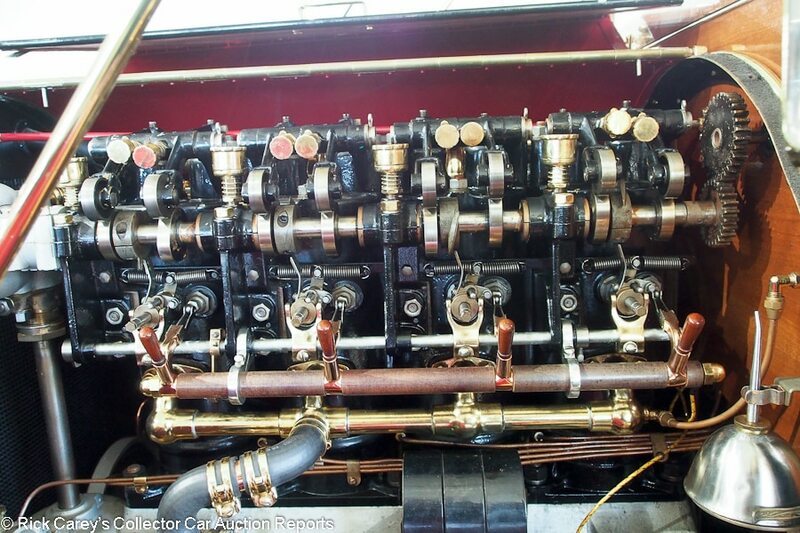 The engine and chassis evidence road use and the expected dribbling from the exposed valve gear. A magnificent 60hp automobile. Don C. Boulton Collection – The Bonhams bidders were serious about this Tincher, opening the bidding at $250,000 and it is somewhat surprising that it closed well under the low estimate. The new owner has a rare prize that should return to the road easily and be something of a marvel anywhere it appears. 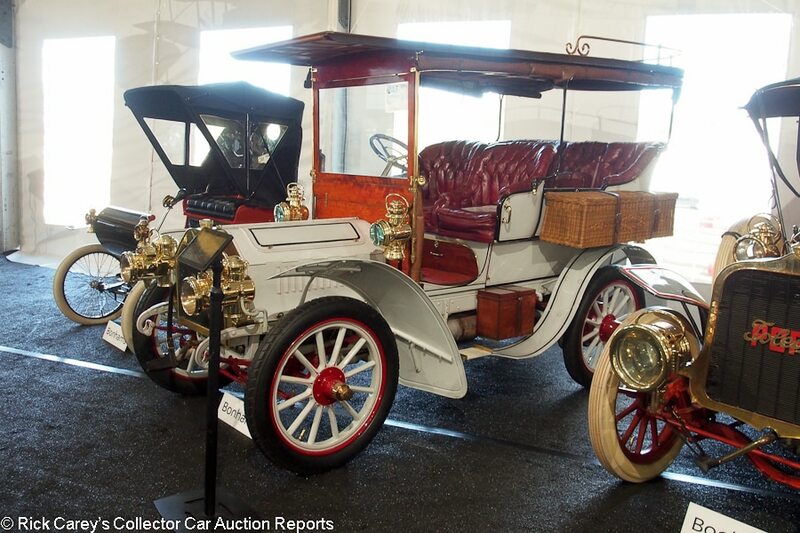 Lot # 287 1911 Stoddard-Dayton Model 11A 5-Passenger Touring; S/N 334; Engine # 11A324; Cream/Cream leather; Cream cloth top; Estimate $120,000 – $150,000; Older restoration, 3- condition; No Reserve; Hammered Sold at $70,000 plus commission of 12.00%; Final Price $78,400. – RHD. 432/40 ALAM hp inline four, 3-speed, Rubes bulb horn, C.M. Hall headlights, kerosene sidelights and taillight, Stewart speedometer, cream wood spoke wheels, whitewall tires. – Sound paint over older paint, tarnished brass, soiled and worn upholstery, soiled paint. Orderly, oily engine. Painted much like a farm tractor all in one color with a reconstructed body. A magnificent auto but seriously in need of attention and fresh cosmetics. – This is a disappointingly presented automobile with a “$29.95 Any Car, Any Color” paint job of Earl Scheib quality. It is under the hood where the Model 11A shines. 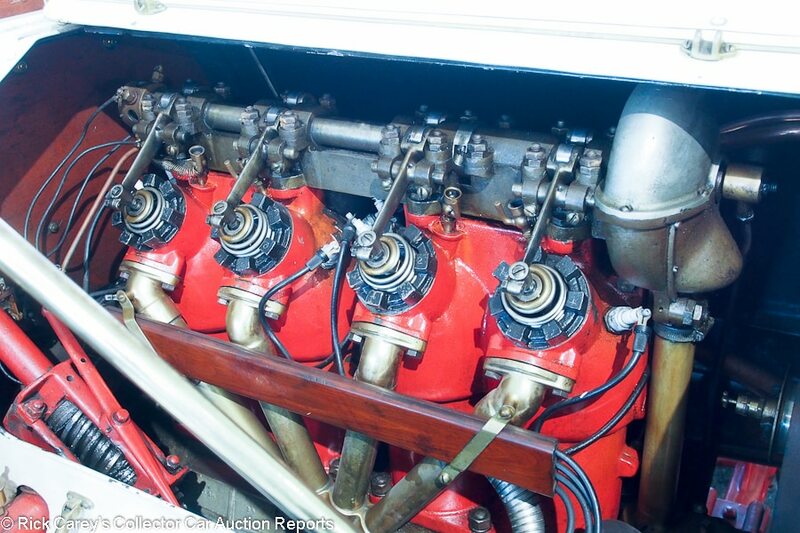 It’s a 4-cylinder but has only four pushrods and four rocker arms to operate its 8 overhead valves. How does that work? The pushrods push up to open the intake valves, then at a suitable interval the stirrup cam followers pull down to open the exhaust valves. 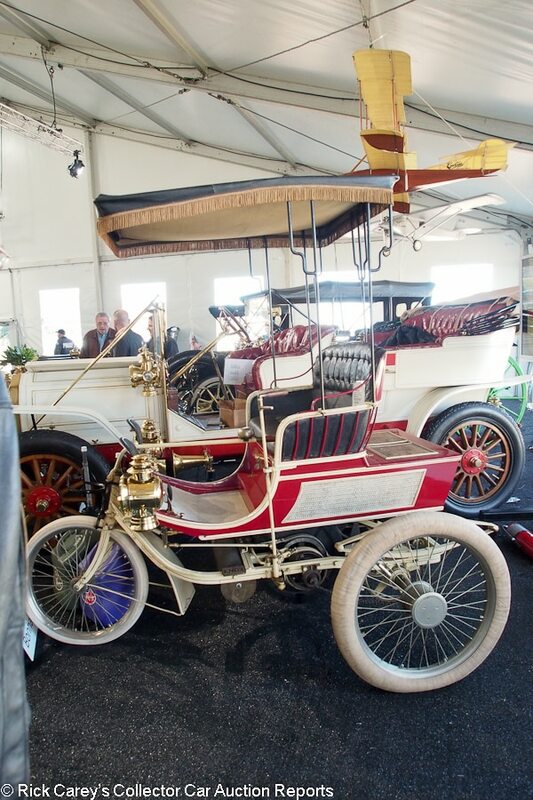 It was a kluge and required lubrication not available in 1911, a design that lasted only one year, but what a concept. I love these imaginative solutions from the early years of the automobile, and watching a Model 11A Stoddard-Dayton engine run is a symphony. By the standard of other more conventional machinery sold today this is a solid value, despite its monochromatic livery. 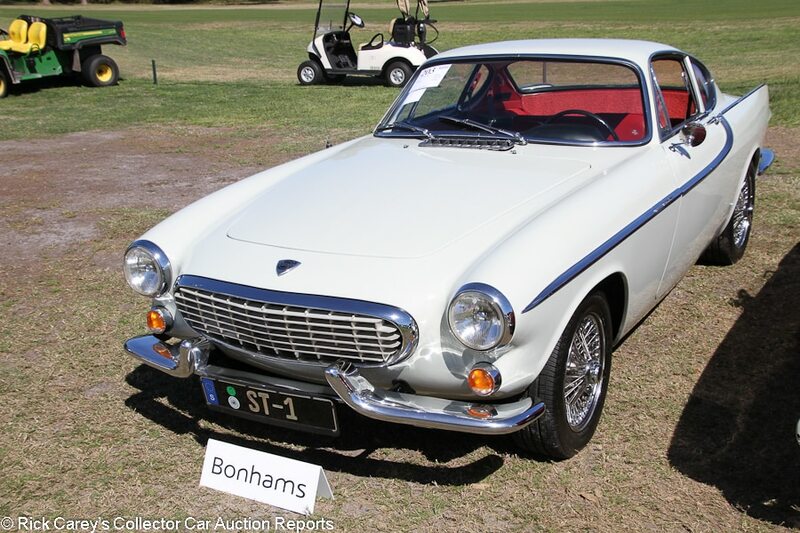 Lot # 203 1963 Volvo 1800S Coupe; S/N 6802; Pearl White/Red vinyl; Estimate $70,000 – $90,000; Visually maintained, largely original, 3+ condition; No Reserve; Hammered Sold at $29,000 plus commission of 12.00%; Final Price $32,480. – Centerlock wire wheels, Uniroyal tires, pushbutton radio. – Scratched up, possibly original bumpers and some light dings on the body side trim. Older repaint in the original Pearl White with some chips around the panel edges. Restoration work underneath, but never taken fully apart. Lightly wrinkled driver’s seat but mostly good interior. A very early S model showing 84,917 miles (barely broken in on an old Volvo). Gorgeous colors and a good example for enjoying on the weekends, but far from show condition and not insignificant mileage. – Production for Volvo’s 1800 sports cars moved from Jensen in the UK to Sweden for the first time in 1963, as Volvo finally had the capacity to build them. Predictably, quality improved as a result. This example looks fantastic in these colors and it’s mostly a good car, but it’s far from the world’s best. It’s also not an all-original time-warp car, and those are the ones that truly bring the big bucks. 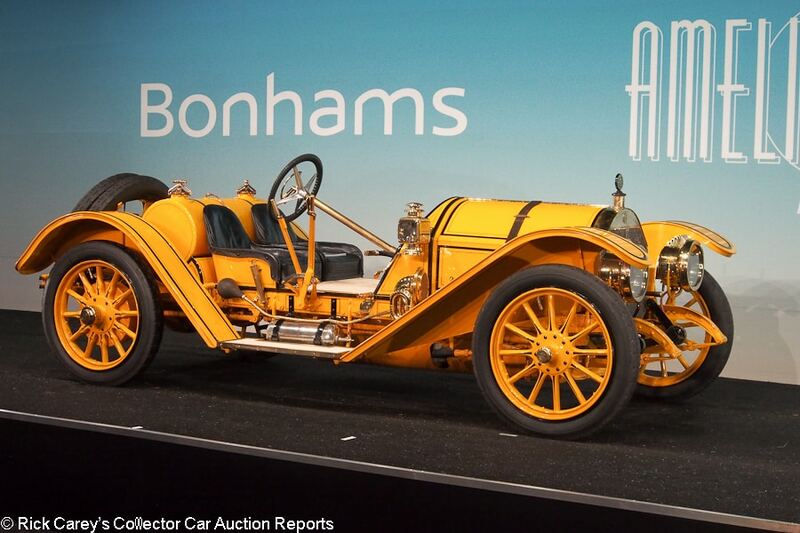 Regardless of Bonhams’ overly ambitious presale estimate, this is strong money for this car. Lot # 205 1985 Toyota Land Cruiser FJ60 Utility Vehicle 4×4; S/N FJ40940286; Heath Gray/Brown; Beige vinyl top; Estimate $60,000 – $80,000; Recent restoration, 2+ condition; No Reserve; Hammered Sold at $38,000 plus commission of 12.00%; Final Price $42,560. – Hub caps, Mud Terrain T/A tires, Warn winch, rear-mounted spare, cassette stereo. 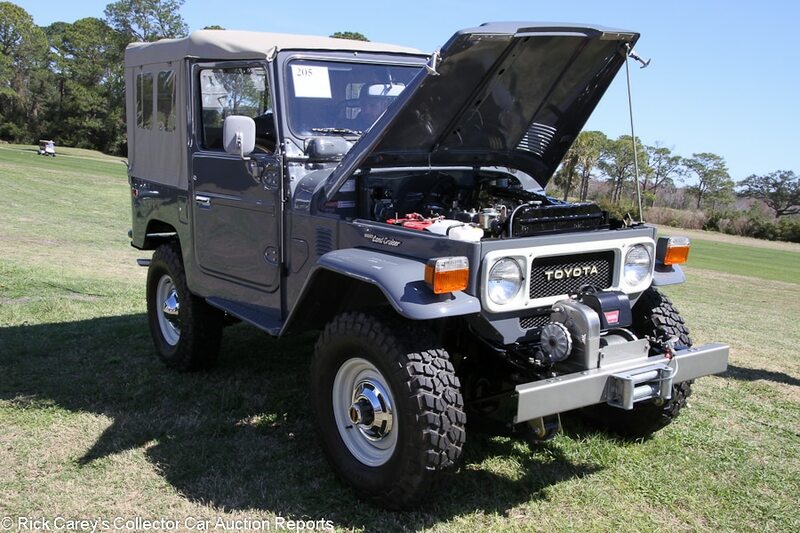 – Rare, very late soft top FJ recently restored to gorgeous standards. Spotless fresh underbody. Freshly detailed, fully restored engine bay. Very good paint and interior. Brand new top. Recently finished and gorgeous. – A fairly modest but not cheap result for such a fresh soft top model, especially since across the street at Russo and Steele, all four classic FJs that sold did so for more than this. A few short years ago there was a market opportunity for restorers to acquire FJs from the fields and ranches of America (both North and Central) and fluff them up with meticulous restorations like this. Astute collectors know that those days have passed and results like this are the new normal. 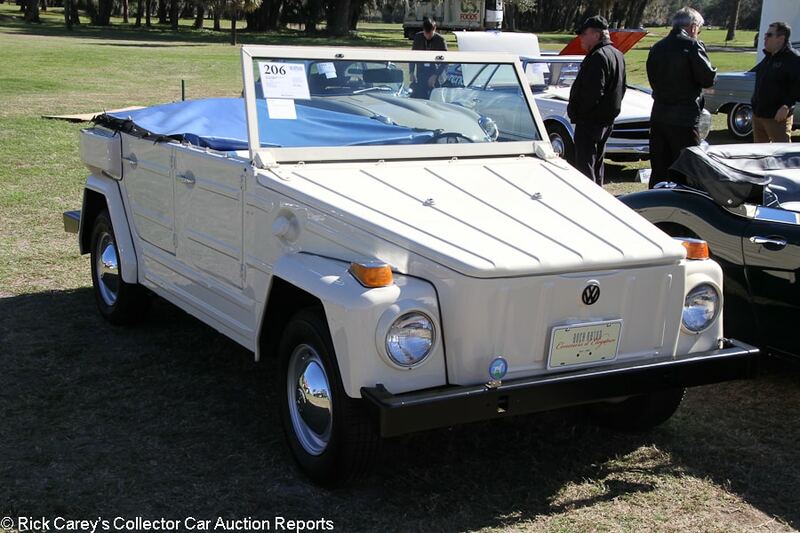 Lot # 206 1974 Volkswagen Type 181 Thing Convertible; S/N 184252287; Atlas White/White, Blue vinyl; Estimate $18,000 – $24,000; Enthusiast restoration, 3 condition; No Reserve; Hammered Sold at $10,500 plus commission of 12.00%; Final Price $11,760. – Hub caps, tonneau cover. – The marker light gaskets are cracked, and so are the lenses. The front right headlight is scratched and dinged. Cloudy, lightly cracked speedo. Ratty, beat up exhaust. Pitted door handles. Quick budget recent paint. Stripped interior. Represented as a restoration done last year, but clearly done on a bit of a shoestring. It’s a driver. – In a world of six-figure Transporters, the 181 Thing seems like a temptingly affordable beach cruiser. While this one has plenty of issues, including an incorrect paint color and seats, it’s better than the price it brought and it seems like a steal compared to the $53,760 for the freshly restored orange Thing over at Gooding & Company’s sale. Things are utilitarian vehicles, inviting wet, sandy grandkids and shaggy dogs into their premises on a summer Sunday. This is the right kind of Thing. 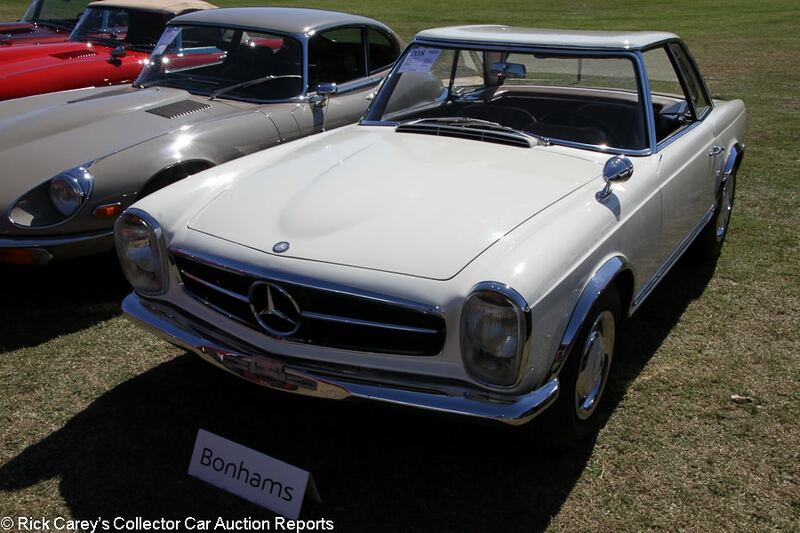 Lot # 208 1966 Mercedes-Benz 230SL Convertible; S/N 11304210015934; Engine # 12798110012575; White/Tan leather; Estimate $40,000 – $55,000; Visually maintained, largely original, 3 condition; No Reserve; Hammered Sold at $30,000 plus commission of 12.00%; Final Price $33,600. – 2308/150hp, 4-speed, hub caps and trim rings, Michelin MXV tires, aftermarket radio, hardtop, original owner’s manual and tools. – Early Euro market Pagoda SL with the desirable 4-speed. Small dent in the front bumper. Long paint crack beside the left headlight, some orange peel on the nose, several chips on the right rear fender and several large touch ups on the door edges, and the paint in general is older but not original. Lightly worn original seats with a small rip on the driver’s side. Faded dash, and the speedometer is faded as well. The trim rings are pretty beat up. Tidy and maintained underneath. The windshield is delaminating. An inherently desirable car and it looked gorgeous driving down the road on the preview day, but it’s a driver that’s miles away from perfect. – This is essentially project car money paid for a slightly tired but still usable Pagoda. Pagoda values have dipped since their peak a few years ago, but they’re mostly flat now and this one could have brought at least 40 grand without being expensive. 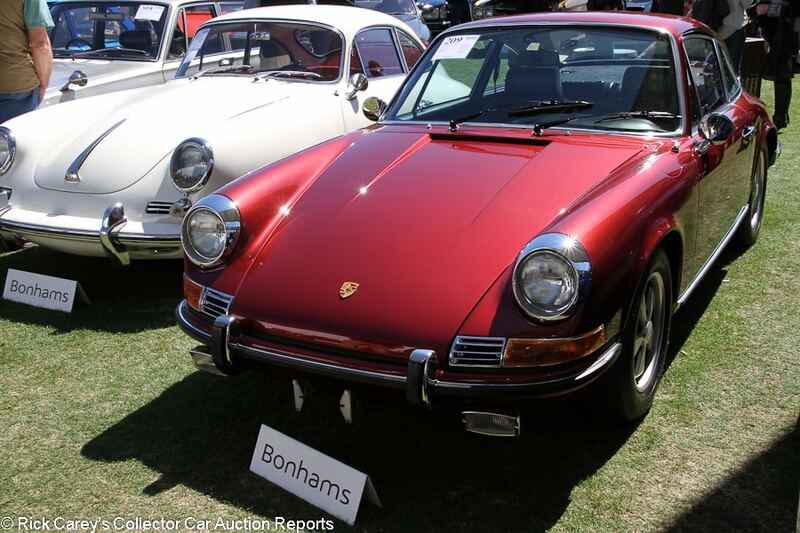 Lot # 209 1969 Porsche 911S 2.0 Coupe; S/N 119301416; Engine # 6392023; Metallic Dark Red/Black leatherette; Estimate $175,000 – $225,000; Older restoration, 2 condition; No Reserve; Hammered Sold at $110,000 plus commission of 12.00%; Final Price $123,200. – 1991/170hp, fuel injection, 5-speed, Fuchs wheels, Vredestein tires, gold brightwork, dual outside mirrors, Blaupunkt radio. – Special order color scheme and represented as matching numbers. Very good paint and brightwork. Very good interior. Spotless and fresh underneath. A few scratches on the window frames but that’s all there is to nitpick. Freshly restored by marque specialists, desirably equipped and gorgeous. 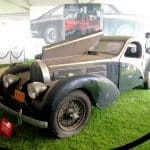 – Right after this car’s restoration was finished in 2013 and well before Porsche-mania peaked in the following couple of years, it sold for $143,000 at Gooding’s Amelia Island sale. It was an appropriately strong result at the time, but the car has barely been used since then. Given what has happened to Porsche values since the beginning of 2013, it should in theory be worth more, so this is a seriously modest result. 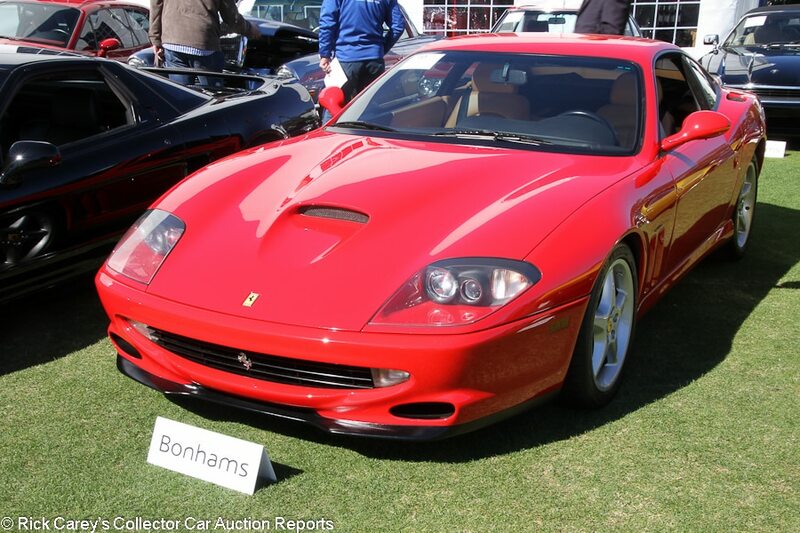 Lot # 210 1998 Ferrari 550 Maranello Coupe; S/N ZFFZR49A1W0111683; Rosso Corsa/Tan leather; Estimate $75,000 – $100,000; Unrestored original, 3+ condition; No Reserve; Hammered Sold at $70,000 plus commission of 12.00%; Final Price $78,400. – Michelin tires, 6-speed, Sony CD stereo, books and tools. – Showing 31,250 believable miles. Several chips on the nose and headlights. Some peeling on the windshield frame. Light wrinkling and flatness on the driver’s seat. Some discoloration on the steering wheel. Classic colors and regularly serviced, but a 20-year-old Ferrari is often more pampered than this, and it’s essentially a driver-quality car. – A very weak price for a 550 in classic colors that doesn’t look particularly bad, but the CARFAX does show a rear-end collision in 2010. While well and professionally repaired, accident history is always going to be a knock to this car’s value. Taking that into account, this price makes a lot more sense. Lot # 211 1970 Chevrolet Chevelle SS 454 2-Door Hardtop; S/N 136370A130493; Autumn Gold, Black stripes/Black vinyl; Estimate $100,000 – $120,000; Older restoration, 3+ condition; No Reserve; Hammered Sold at $68,000 plus commission of 12.00%; Final Price $76,160. – LS6 454/450hp, M22 4-speed, power steering and brakes, SS wheels with Firestone Wide Oval tires, bench seat, AM radio, Protect-O-Plate, Positraction. Chevy Vettefest Gold Spinner Award winner. – Fresh paint. The trim and bumpers do not have any wear. The engine compartment is clean and restored but not completely correct, hose clamps are a combination of correct and parts store variety. There is residue on the underside of the hood which appears as if the radiator burst and it wasn’t detailed and the air cleaner stickers are peeling. The engine does show some deterioration from use and there is a pool of gas on the intake from the carburetor. The interior has been redone and shows little use. A 2005 restoration with corners cut, but a genuine LS6 so it’s inherently desirable. – Not a great car, but for a genuine and restored LS6 with a 4-speed this is a low price. 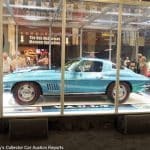 In an auction packed with brass-era motorcars, Jaguars and Porsches, a muscle car seems like an odd fit and it likely would have had better luck at another venue but this result is the new owner’s good fortune. 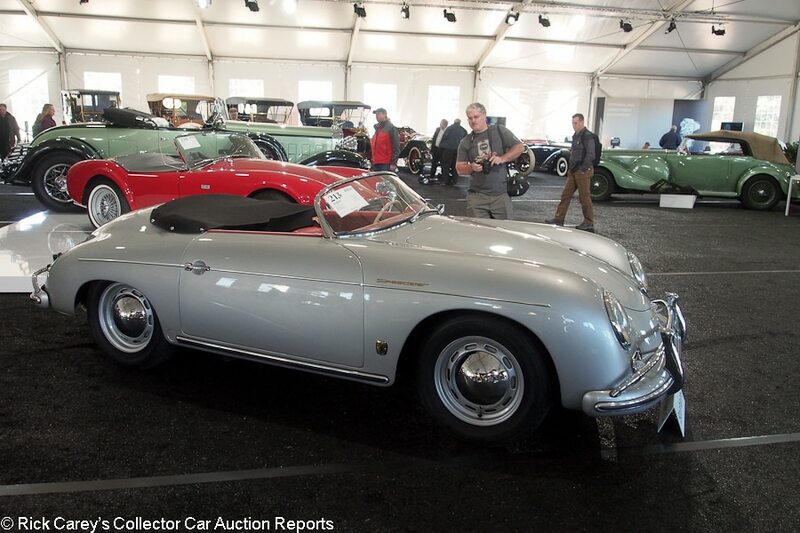 Lot # 213 1956 Porsche 356A 1600 Speedster, Body by Reutter; S/N 82639; Engine # 65307; Silver/Red leatherette; Black cloth top; Estimate $350,000 – $450,000; Recent restoration, 2+ condition; With Reserve; Not sold at Hammer bid of $270,000. – Beige steering wheel and shift knob, hubcaps, Vredestein tires, bumper overriders, factory hardtop, tool kit, Porsche CofA, Kardex copy. – Fresh clearcoat repaint, tight interior, beautiful engine compartment. Flush panel fits and even gaps facilitated by filler on both sides, particularly the rear fenders. Later replacement type 616/1 engine. – Not sold? Not a surprise at the reported high bid. Even the body filler – pretty much standard on Porsches of this era – and replacement engine aren’t enough to warrant the lack of appeal shown by the Bonhams bidders. No respect at all was given to the factory hardtop included in the package. It should have brought well over $300K. 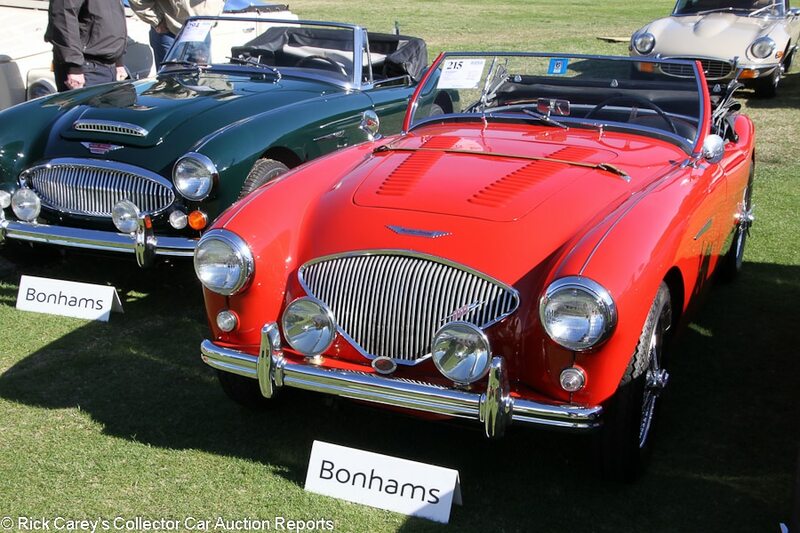 Lot # 215 1955 Austin-Healey 100-4 BN1 Roadster; S/N BN1L220856; Engine # 1B220856M; Carmine Red/Black piped in Red; Black top; Estimate $70,000 – $90,000; Older restoration, 3+ condition; No Reserve; Hammered Sold at $39,000 plus commission of 12.00%; Final Price $43,680. – 2660/90hp, chrome wire wheels, Vredestein tires, later 4-speed with overdrive, Stewart Warner amp and vacuum gauges, VDO temp gauge, dual mirrors, banjo steering wheel, driving lights, original invoice and handbook. – Four-owner car restored in the 1980s and kept up with since. The driving lights are a little dirty and the chrome looks older. Slightly erratic panel gaps. Worn steering wheel. A little dirty underneath but not bad. An attractive event car, but you wouldn’t enter it into a show. – Sold for $81,000 at Mecum Kissimmee in 2014, then not sold at a $60,000 high bid at Mecum Monterey 2015, the updated transmission is a knock on its originality but a huge boost in its drivability. All things considered, this is a blissfully benign result for the new owner, a seriously good value. 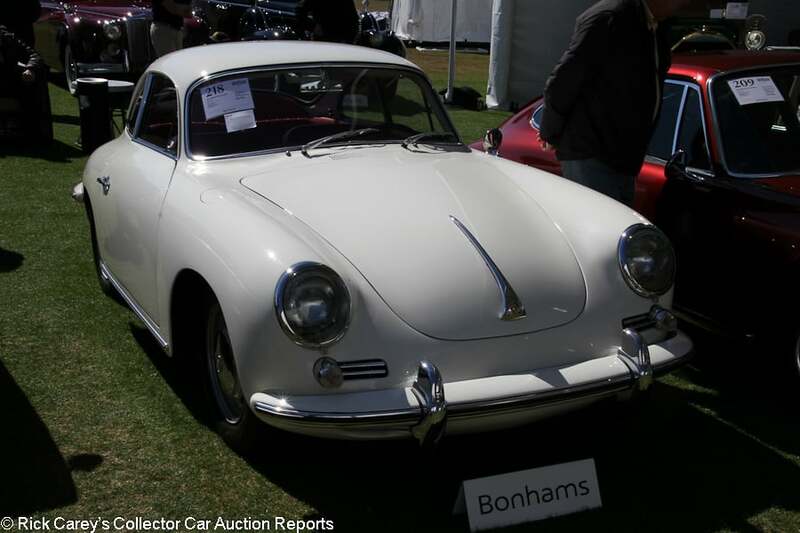 Lot # 218 1964 Porsche 356C 1600 Coupe; S/N 218390; Engine # 713701; Light Ivory/Red leather; Estimate $70,000 – $90,000; Recent restoration, 2- condition; No Reserve; Hammered Sold at $68,000 plus commission of 12.00%; Final Price $76,160. – 1,582/75hp, hub caps, store brand all season tires, gold brightwork, spare, jack and partial tool kit, Porsche CofA. – Represented as matching numbers. Very good paint, but the brightwork looks older and the rear quarter window frames are lightly pitted. Very good fresh interior. Very clean underneath. Body-on restored from 2013-16. Recently finished and not overrestored, just done to essentially like new standards although a few details like the brightwork were missed. – It’s not a show car and its early history isn’t known, but this is a better car than the price it brought, which would ordinarily buy a less attractive driver-quality 356C Coupe. Lot # 219 1989 Porsche 911 Turbo 930 Cabriolet Slant Nose; S/N WP0EB0936KS070543; Guards Red/Black leather piped in Red; Black top; Estimate $175,000 – $250,000; Unrestored original, 2 condition; With Reserve; Hammered Sold at $222,500 plus commission of 12.00%; Final Price $249,200. – Slant nose, red painted Fuchs wheels, Toyo tires, snorkely brake light, boot cover, Blaupunkt cassette stereo, books, tools, Porsche CofA, manuals and tools. 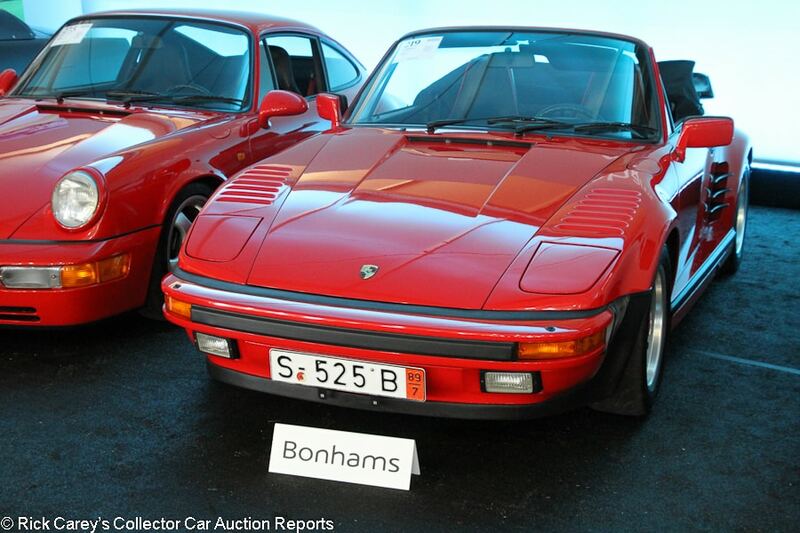 – Factory final year 930 slant nose cab showing 5,924 represented original and thoroughly believable miles bought new by Dr. Jack Frost and later passed to his son, one family owned from new. In storage for a while, but brought back to running order in recent years. Other than a tiny, tiny chip on the right headlight door it looks like a new car. – Values for the 930 have retreated recently, but as a final year model with incredibly low mileage and a factory slant nose (which can command a 30 percent premium), this one brought a deservedly top dollar price. Lot # 220 1989 Nissan Skyline GT-R Coupe; S/N BRNR32003106; Gunmetal Grey/Grey cloth; Estimate $50,000 – $60,000; Unrestored original, 2- condition; No Reserve; Hammered Sold at $40,000 plus commission of 12.00%; Final Price $44,800. – RHD. 2,568/276hp twin turbo six, 5-speed, Bridgestone Potenza RE-01 tires, cassette player, air conditioning, chipguarded nose, Ceramic Pro 9H paint protectant, UV protectant on the windows, OEM wheels included. – Represented as 40,390 km from new. The paint is very good, but the front bumper has three touch ups. The underbody is clean and has little deterioration or wear. The interior is excellent and shows no significant use. Bought in Japan by an American two years before it was eligible for import, then made its way Stateside once it turned 25. Not perfect, but reasonably well kept and all-stock. – Lots of R32 GT-Rs received heavy mods and were generally beat on, but there are also lower-mile more immaculate cars than this as well. This result takes all that into account and should be a number that both parties are happy with. Lot # 221 1969 Porsche 911E Coupe; S/N 119200650; White/Cork leatherette; Estimate $100,000 – $125,000; Older restoration, 2- condition; No Reserve; Hammered Sold at $92,500 plus commission of 12.00%; Final Price $103,600. 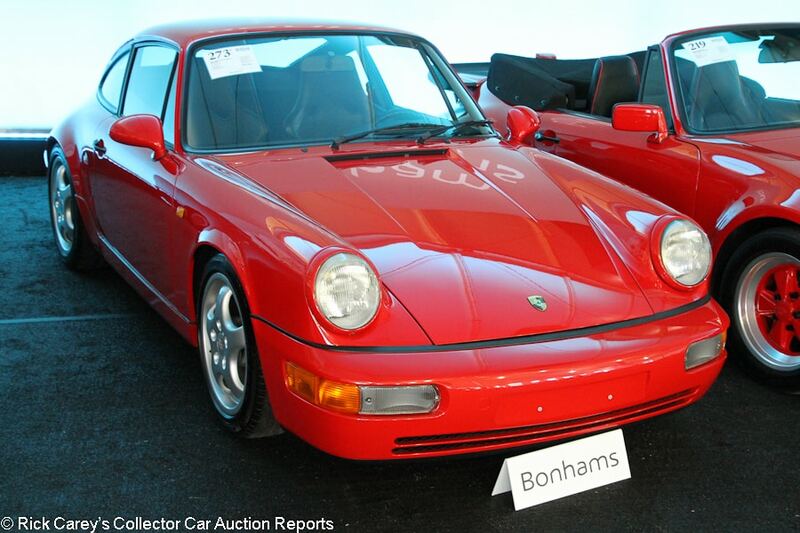 – 1991/140hp, Bosch injection, 4-speed, Fuchs wheels, factory roll bar and air conditioning, woodrim steering wheel, pushbutton radio, Porsche CofA. – Light wrinkling on the driver’s seat but mostly very good interior. Very good paint and chrome. Light scratching on the window frames. Even gaps. Clean, lightly restored engine bay. Well restored roughly 10 years ago and finished in attractive original colors. – Sold by Gooding at Pebble Beach in 2011 for $104,500 and then again in 2014 at Amelia for $137,500. Gooding sold it again for $97,900 in 2017 and 95 miles ago. The last two results are the most realistic and take into account both the desirable equipment and the age of the restoration. 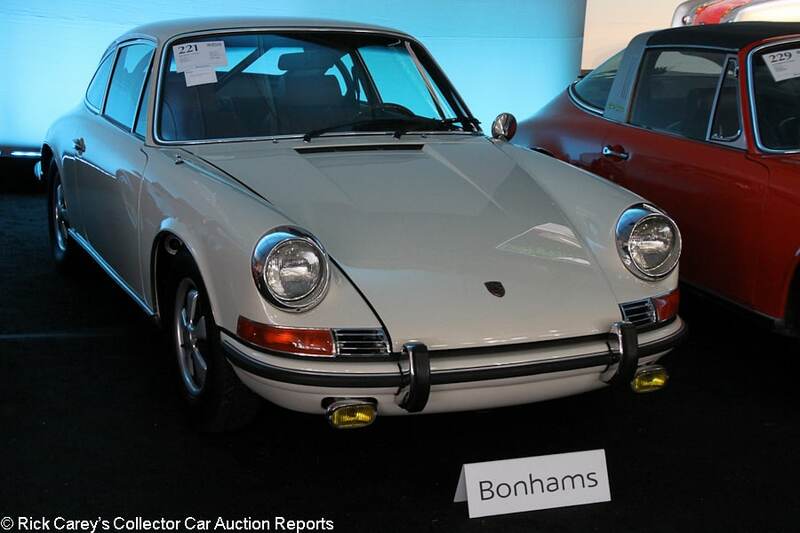 Several Porsches sold for modest results at this auction, but this is an appropriate price for a good 911E, the model that sat between the 911T and the 911S in the Porsche hierarchy at the end of the ’60s. 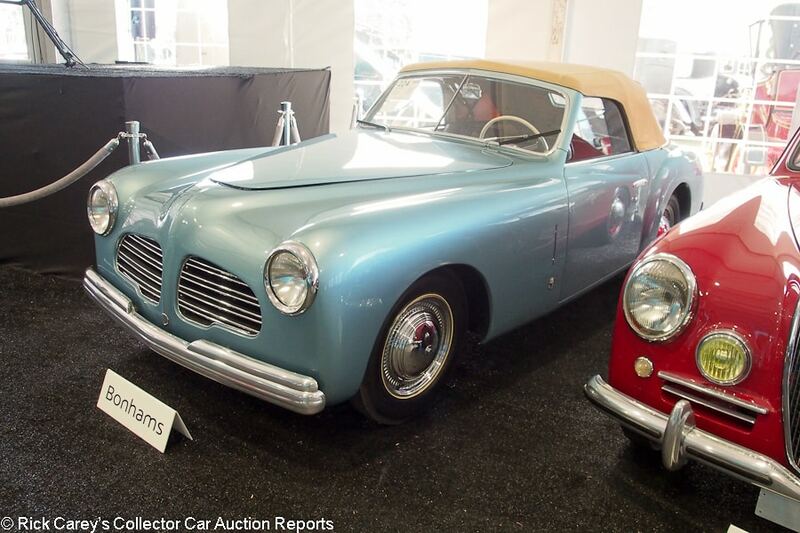 Lot # 224 1950 Fiat 1100 Cabriolet, Body by Stablimenti Farina; S/N 329030; Engine # 393200; Ice Blue/Dark Blue leather; Beige cloth top; Estimate $150,000 – $175,000; Older restoration, 2- condition; With Reserve; Not sold at Hammer bid of $100,000. – 1,089cc/52hp four-cylinder, white filament wrapped banjo spoke steering wheel, wheel covers, Puma tires, column shift. Scratched passenger’s windshield, oil filter, 2-barrel downdraft Weber carburetor. – Decent paint and chrome. Lightly stretched upholstery and folding wrinkled top. Orderly restored engine compartment showing some age. Good underbody. Restored like new to good driver standards some time ago with subsequent use. – Reported sold in 2005 by Coys at Padua for $80,426 (Euros 70,200 at the time, the high bid here is Euros 88,900.) This nearly unique Stablimenti Farina-bodied little Fiat, one of four believed to have survived, has some pretty wonderful event eligibility and it is easy to look at. It is worth at least what was offered for it here, but not much more. Lot # 225 1939 Delage D6-70 3-pos. 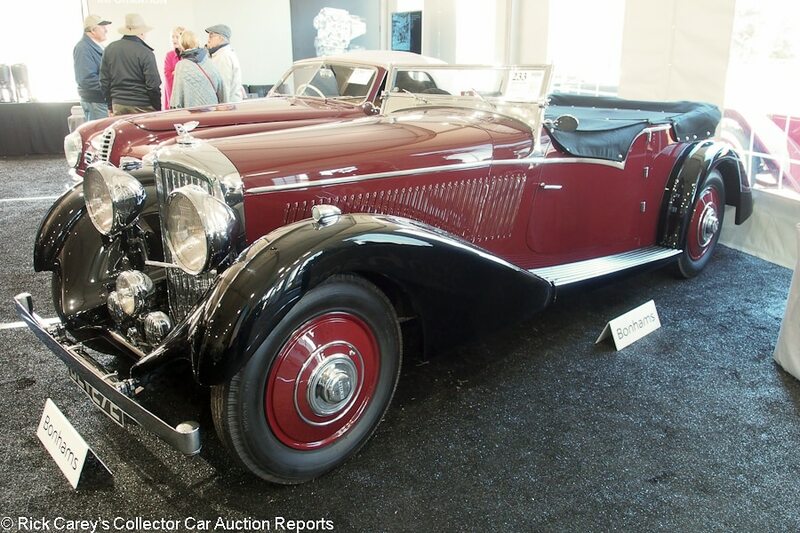 Drophead Coupe, Body by Figoni & Falaschi; S/N 51740; Engine # 51740; Dark Blue/Red leather; Beige cloth top; Estimate $500,000 – $600,000; Older restoration, 2- condition; With Reserve; Not sold at Hammer bid of $400,000 – RHD. Body color steel spoke wheels, hubcaps, wide whitewalls, Marchal headlights and fog lights, banjo spoke steering wheel, Cotal preselector gearbox, opening windshield, fender skirts. – Very good lightly swirled paint, bright chrome, lightly mellowed upholstery. The underbody and engine compartment are redone and lightly used. Side trim chrome is thin and scuffed. Competently restored, carefully used and a great car for touring. – Sold at Barrett-Jackson in 2001 for $175,000, it is a seriously attractive car that has been consistently maintained and is claimed to have recently had “a sizeable amount of [mechanical] work”. The reported high bid here is not unrealistic, just conservative. Lot # 227 1971 Mercedes-Benz 280SE 3.5 Coupe; S/N 11102612003702; Engine # 13092012019757; Sky Blue/Parchment leather; Estimate $70,000 – $90,000; Enthusiast restoration, 2- condition; No Reserve; Hammered Sold at $29,000 plus commission of 12.00%; Final Price $32,480. – Retrofitted straight-six in period with dual Webers, automatic, wheel covers, sunroof, air conditioning, Becker Europa radio (aftermarket Alpine unit installed in the console and aftermarket speakers behind the rear seats), column shift. – Two-owner car and, while delivered with a 3.5, the original owner replaced it with a 2.8-liter six. The second owner did some restoration work, including air conditioning, upgraded stereo and paint in Sky Blue (a Ferrari shade). Faded, lightly scratched bumpers. Two large cracks at the front of the hood. Light scratches on the window frames and light track scratches on the driver’s window. Very good interior. Doesn’t look restored underneath, but it’s clean and maintained. This car does have flaws, but you have to look up close to find them. It’s finished in gorgeous colors and has a lot of presence, so it would make a great driver. – An attractive car, but it has a lot going against it. The engine is not only not original, it’s a downgrade from the original spec, and the paint is an incorrect color even if it does look good. This is below rock bottom money for a genuine 280 SE 3.5, but all of the above puts the number into perspective, plus it sold for $26,400 at Barrett-Jackson Scottsdale in 2012. The modifications mean that that this is a meaningless result. 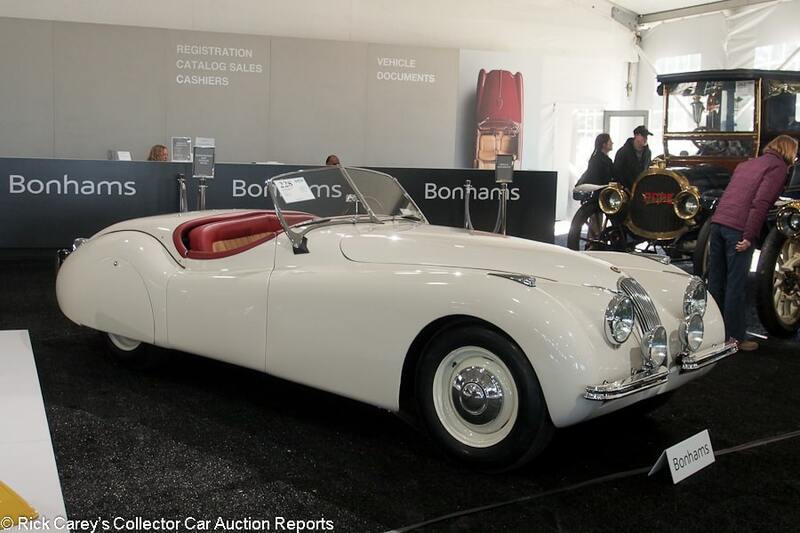 Lot # 228 1950 Jaguar XK 120 Alloy Roadster; S/N 670181; Engine # W12658; OEWhite/Carmine, Beige leather; Black cloth top; Estimate $300,000 – $350,000; Enthusiast restoration, 2- condition; With Reserve; Not sold at Hammer bid of $240,000. – Steel wheels, hubcaps, spats, Lucas tri-bar headlights, Lucas fog lights, JDHT certificate documented. – Excellent paint, chrome and interior. The underbody and engine compartment are restored to good but not exceptional standards. The wheels have been clumsily painted with the balance weights attached and the tires mounted. The front fenders are later replacements. The chrome is thin on the headlight peaks. Restored to decent cosmetic standards but mediocre mechanically. – One of 184 lefthand drive, disc wheels, fender spats alloy body XK 120s built, single family owner since the 1960 but the victim of a 10 year long amateur restoration with many shortcomings. 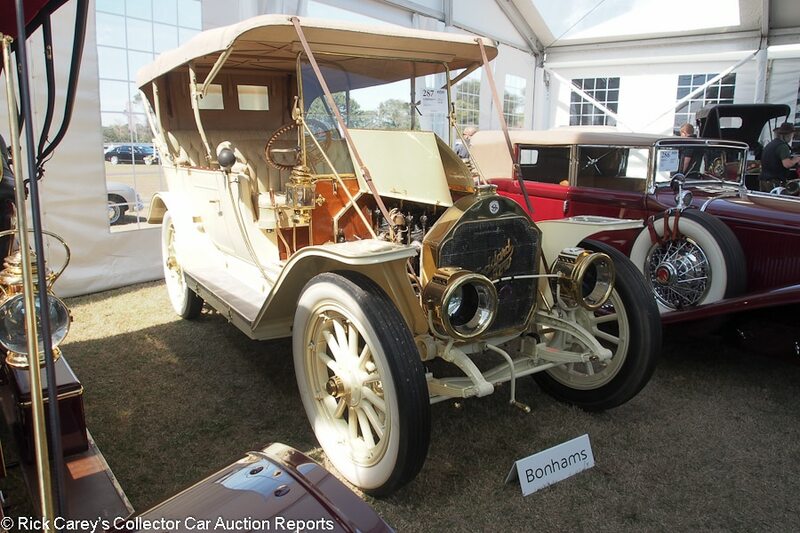 It might be the $300,000 car of Bonhams moderate pre-sale estimate but the bidders were wise to keep their offers to this even more modest level. It is too good to restore again, but its restoration is not anywhere close to what the car deserved. Lot # 230 1951 Alfa Romeo 6C 2500 SS Cabriolet, Body by Pinin Farina; S/N 915922; Engine # 928329; Burgundy/Beige leather; Beige cloth top; Estimate $600,000 – $750,000; Concours restoration, 1- condition; With Reserve; Not sold at Hammer bid of $440,000. – RHD. Silver painted wire wheels, Michelin tires, Carello headlights, column shift, white banjo spoke steering wheel rim, trafficators. – Original engine. Displayed at Pebble Beach in 2015 fresh from restoration, then Villa d’Este and Chantilly. Impeccably restored to concours condition aside from light polisher swirl, two tiny blemishes, one at the front of the hood and another on the left door, and two paint cracks at the base of the right windshield post. – Sold by Gooding at Pebble Beach in 2016 for $621,500 and offered by Bonhams in Scottsdale six weeks ago where it was reportedly bid to $540,000 against a slightly higher estimate than was posted here. Trying twice in less than two months is the sign of desperation by the seller and the amount bid here is similarly a sign the bidders knew it and hoped to make a steal. It will now have to try again, or take another course to market following two failures. 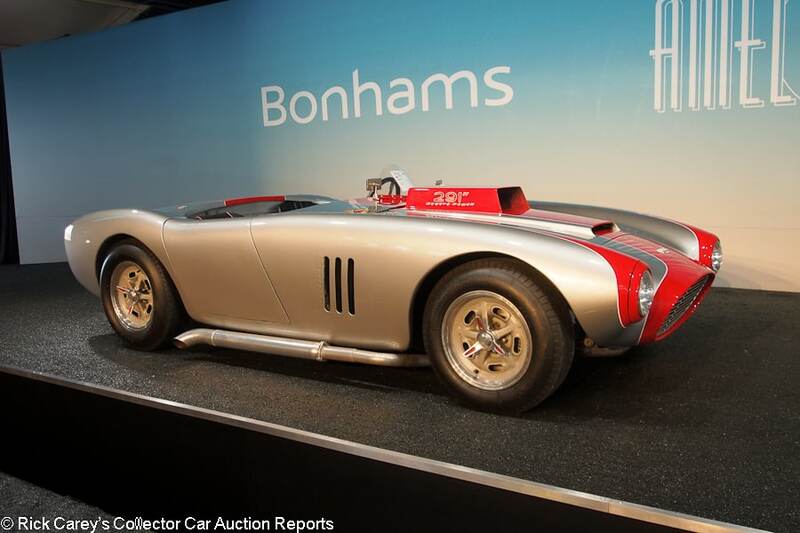 Lot # 231 1954 Kurtis 500KK SR-100 Sports Racer, Body by Byers; S/N MKK55; Silver, Red stripe/Black vinyl; Estimate $200,000 – $250,000; Competition restoration, 3 condition; With Reserve; Not sold at Hammer bid of $145,000. – DeSoto 219/275hp engine, dual 2-barrel carbs, 4-speed, Halibrand-style alloy wheels with dummy 3-wing knock-on spinners, 4-spoke fat rim steering wheel, silver painted side exhausts, bucket driver’s seat, 3-point belts, driver’s aeroscreen, Dunlop Racing tires. – Sound but aged paint with a few chips, scratches and generally scuffed. Orderly but aged underbody and engine compartment. Restored in Carrera Panamericana style and livery in the 90’s, displayed at Pebble Beach in 1993. Historic raced since and in remarkably good condition considering the age of the restoration and its many years of vintage racing. – It’s an illustrious history but the reported high bid is in line with similar Kurtis 500s. It’s not the original engine (it was a GMC six when first built for the 1954 Carrera) and its use and age are apparent, all of which weigh on value. 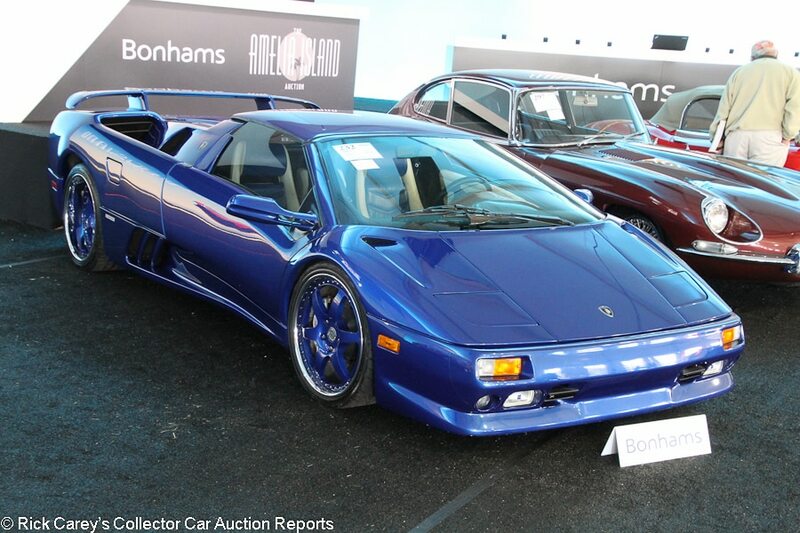 Lot # 232 1997 Lamborghini Diablo VT Roadster; S/N ZA9RU37P4VLA12621; Blue Chiaro/Blue, White leather; Estimate $175,000 – $200,000; Unrestored original, 3 condition; No Reserve; Hammered Sold at $110,000 plus commission of 12.00%; Final Price $123,200. – Clear bra on the nose, HRE wheels, Pirelli tires, aftermarket exhaust, carbon fiber interior trim, later Pioneer stereo with Bluetooth. – The gel coat on the carbon transmission tunnel is dull and there’s a small crack on the driver’s side. The seats and carpets are lightly worn. Light scratches on the front bumper and several more on the removable roof. Small scrape on the rear wing. Huge chip off of the right corner of the rear bumper, which looks painted. A VT Roadster is rare and inherently collectible, but this one has several strikes against it: Incorrect radio and exhaust, body damage and lots of paint flaws don’t do it any favors at all, plus those HRE wheels aren’t to everyone’s taste. – The Diablo has a pretty bright future in terms of collectability, as the first Lambo with all-wheel drive and the last of the big V-12 cars before the Audi era. But cars like these that show there age (and in this case, damage and cafe racer updates) are going to be passed over by the serious collectors who are willing to pay top dollar. This is a very low price for a Diablo Roadster in today’s market, but given this car’s numerous issues it isn’t surprising. Lot # 233 1936 Bentley 4 1/4 Liter Tourer, Body by Vanden Plas; S/N B138GA; Engine # K6BW; Burgundy, Black fenders/Burgundy leather; Black cloth top; Estimate $600,000 – $800,000; Older restoration, 2- condition; With Reserve; Not sold at Hammer bid of $490,000. – RHD. Low windshield, body color wheel discs, Dunlop tires, Lucas headlights and dip beam light, folding windshield, Monit digital speedometer, tonneau cover, enclosed rear spare, trafficators, overdrive added. – Still has the original body on this chassis. Frequently used in the UK after its early Naughts restoration, 3rd in class at Pebble Beach in 2009. Very good older paint, chrome and lightly stretched and surface creased upholstery. The engine compartment is clean and orderly but showing some age and use, as is the underbody and chassis. 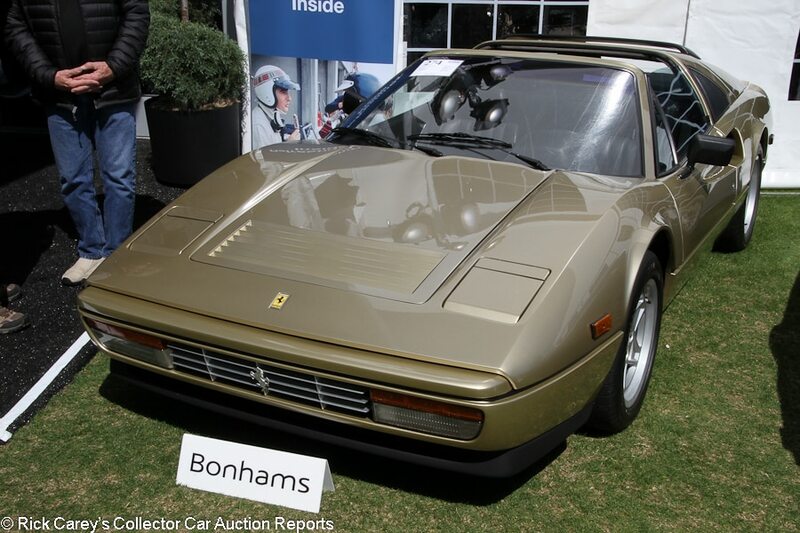 – Sold by Bonhams at Quail Lodge in 2016 for $660,000 and there is little or no reason why it should be worth less than $500K, which is reason enough for the consignor (who was the 2016 purchaser) to take it back home. Lot # 234 1923 Bugatti Type 23 Brescia Three Seater Torpedo Sports; S/N BOC02; Engine # 892(ex-2526); Red, Black fenders/Black leatherette; Estimate $300,000 – $400,000; Rebodied or re-created, 3 condition; With Reserve; Hammered Sold at $178,571 plus commission of 12.00%; Final Price $200,000. – RHD. Black wire wheels, Dunlop tires, single left side spare, Simplicora bulb horn, Marchal headlights, Jaeger clock and tachometer, vee windshield, brass radiator. – Assembled in Australia for an unknown source Brescia chassis, engine from 2526, other parts from 2569, Bugatti Owner’s Club numbered BOC02. Strange lumpy paint on the cowl, otherwise good paint. Sound old upholstery. Dull teakwood rear deck planking. Coolant stained radiator shell and dull headlight trim. Dirty, road grimy chassis that is much older than the paint. Done to driver standards long ago, then driven extensively and recently repainted, it needs more to show, but has proven itself for touring as recently as last fall’s International Bugatti Tour. – This is a serious value for a BOC-recognized Type 23 Brescia (Type 23 signifying the 2550mm wheelbase; Type 22 is 2400mm) even as well-used as it is. It is a surprising result for a car with a long history in its present configuration and the new owner should be proud to drive it this summer. 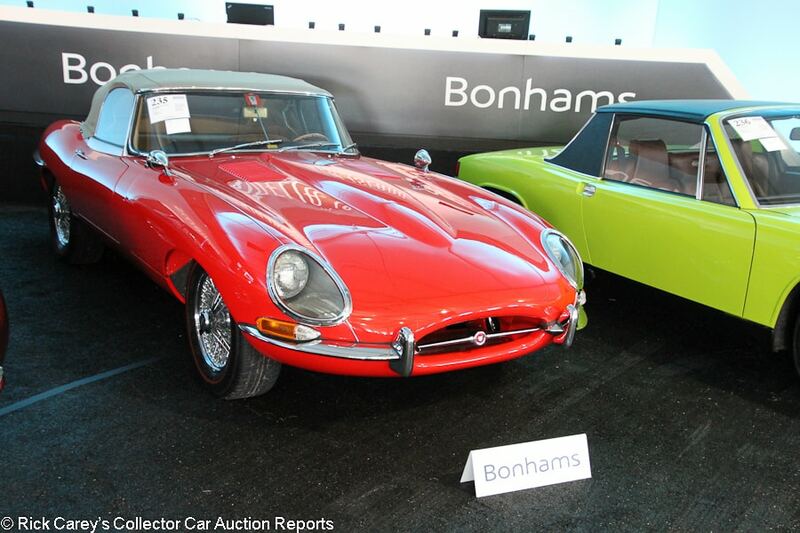 Lot # 235 1964 Jaguar XKE SI Roadster; S/N 880937; Engine # RA50429; Carmine Red/Tan leather; Tan cloth top; Estimate $200,000 – $250,000; Older restoration, 2- condition; No Reserve; Hammered Sold at $90,000 plus commission of 12.00%; Final Price $100,800. 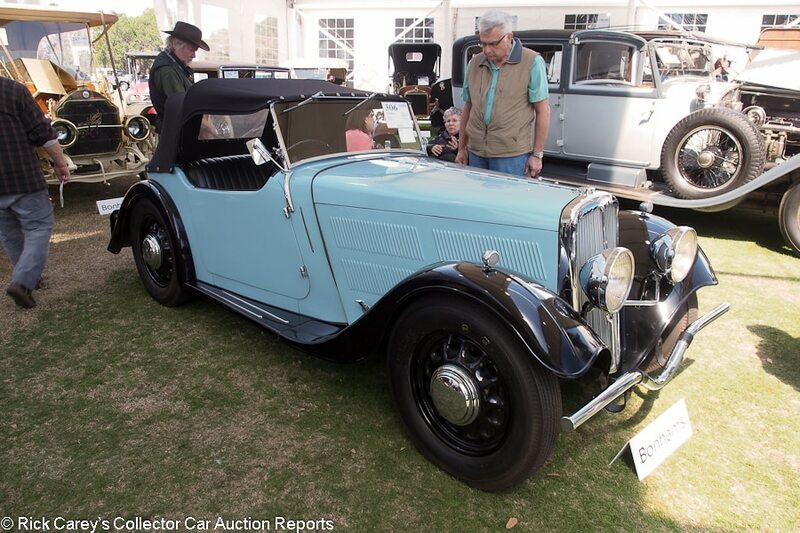 – 3781/265hp, later synchromesh 4-speed (the original Moss box is included), chrome wire wheels, Avon Red line tires, dual Talbot Berlin mirrors, LeCarra woodrim steering wheel, pushbutton radio, JDHT Certificate. – Small cracks in the bumper gaskets. Very good and bright older paint and chrome, but there is one unfortunate large chip on the bottom of the trunk lid. Clean, straight top. The driver’s door doesn’t quite fit flush with the body. Clean wheels and very clean underbody. 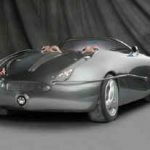 A high quality 90’s restoration of a desirably configured XKE. It wasn’t done yesterday and won’t be taking home Best in Show, but it’s still gorgeous. – Low-100s is just about driver money for an SI Roadster these days, and this car is much better than that despite the age of its 1990s restoration. It is a great buy at this price. Lot # 236 1974 Porsche 914 2.0 Targa; S/N 4742907096; Revenna Green, Black roof/Brown vinyl; Estimate $80,000 – $100,000; Detailed to restored, 2+ condition; No Reserve; Hammered Sold at $80,000 plus commission of 12.00%; Final Price $89,600. – 5-speed, steel wheels, Michelin XZX tires, pushbutton AM-FM radio. – Showing just 17,288 miles, which are represented as original. The original Revenna Green paint is flawless and looks fantastic, the bumpers are a little dull but aren’t at all dry. The interior is immaculate and the underbody is very clean as well with what looks like new exhaust. Gorgeous and apparently totally unrestored. Only driven by the original owner as a vacation car, then sat until 2011 when the next owner painstakingly detailed it for concours events. It’s a 914 pampered like a 911, and although this color looks more at home on a Lambo, it works on a Porsche too. – Low miles, good colors, total originality and an incredible level of preservation mean this car ticks all the right boxes. 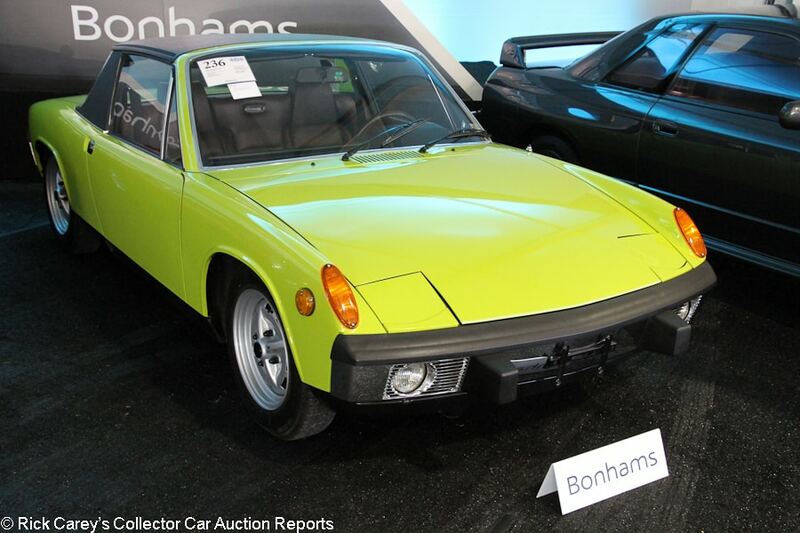 RM and Gooding have sold like-new original examples for over 90 grand so this isn’t a record number, but it does show what kind of money it takes to get one of the best four-cylinder 914s in the world. It’s not often that any car gets a “Detailed to restored” description, but this Porsche 914 earned it, a marvelous low mileage survivor and a prize for the new owner. 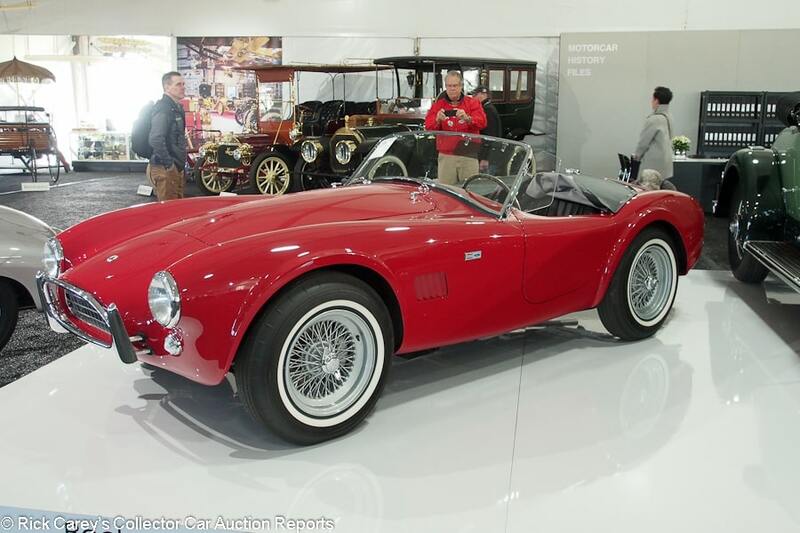 Lot # 238 1964 Shelby Cobra 289 Roadster; S/N CSX2328; Engine # PA4539; Red/Black leather; Estimate $900,000 – $1,100,000; Recent restoration, 2+ condition; With Reserve; Not sold at Hammer bid of $800,000. – Grey painted wire wheels, narrow whitewall bias ply tires, grille and trunk guards, wind wings, tinted sun visors, rack & pinion steering, front wheel vents, documented from new. – Known history from new and represented as the original drivetrain. Excellent cosmetics. The upholstery shows no use at all, the underbody is like new. Shown at Hilton Head in 2017 where it won a Palmetto Award and at Amelia Island last year. – Offered by Bonhams at Quail Lodge last August where it was reported bid to $950,000, the only reason it might be worth less than that here at Bonhams Amelia is a softening market particularly in expensive cars. 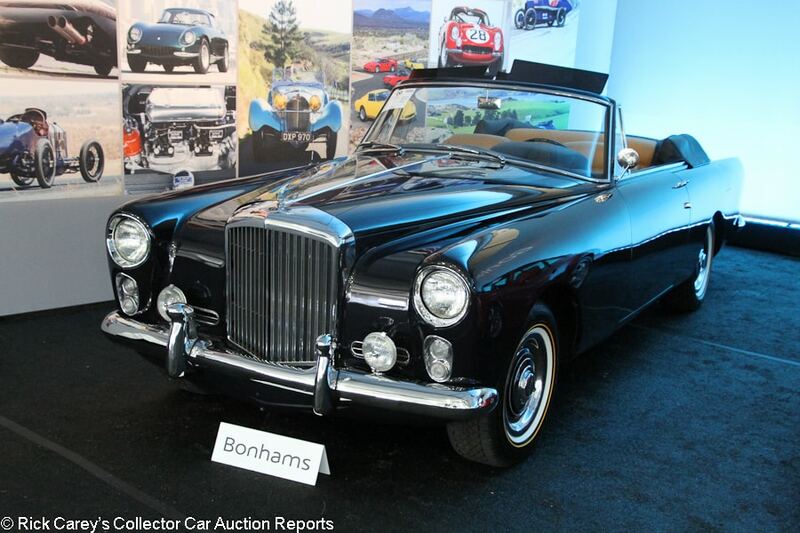 Lot # 239 1960 Bentley S2 Continental Drophead Coupe, Body by Park Ward; S/N BC54LAR; Engine # P4055; Midnight Blue/Tan leather; Black top; Estimate $200,000 – $275,000; Older restoration, 3+ condition; With Reserve; Hammered Sold at $145,000 plus commission of 12.00%; Final Price $162,400. – Replacement engine, wheel covers, gold line tires, Flying B mascot, Lucas driving lights, leather boot cover, wood dash and window trim, pushbutton radio. – One of 65 built in LHD. Represented with recent cosmetic and mechanical freshening. Not particularly good paint up close with some orange peel and a handful of scratches. Light smudges, wrinkling and discoloration to the seats. Good wood. Unrestored but tidy underneath. Commissioned new by J. Robert Neal, an heir to the Maxwell House fortune. Not a show winner, and of course less desirable with a replacement engine, but still gorgeous. – Offered by Russo and Steele at Monterey in 2013 with a reported high bid of $145,000, reported sold by them at Scottsdale in 2014 for $148,500, then by RM at Monterey in 2018 for $173,600 where it showed exactly the same 61,001 miles as it does today. It’s a flawed Bentley that brought an appropriately modest price. 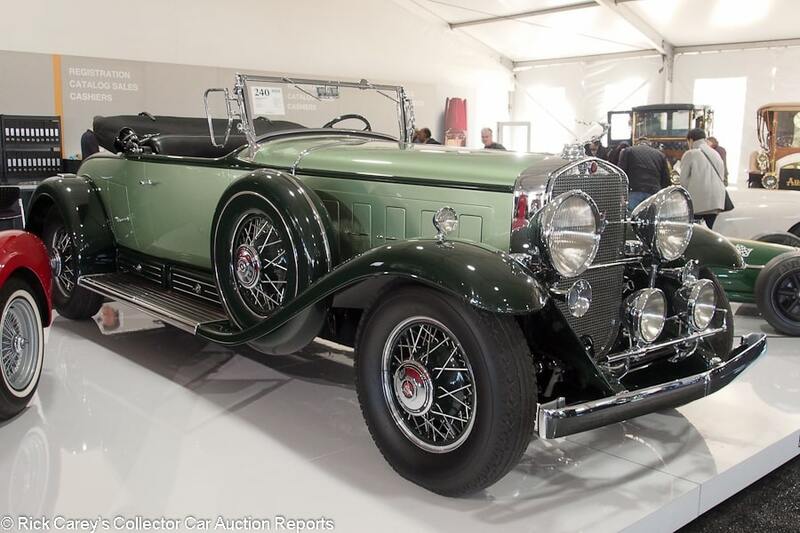 Lot # 240 1930 Cadillac 452 V-16 Roadster, Body by Fleetwood; S/N 7952; Engine # 701056; Metallic Light Green, Dark Green fenders/Black leather; Black cloth top; Estimate $1,250,000 – $1,500,000; Concours restoration, 1- condition; With Reserve; Hammered Sold at $1,075,000 plus commission of 10.47%; Final Price $1,187,500. – Chrome spoke Dark Green wire wheels, Firestone blackwall tires, dual enclosed sidemounts, wind wings, rumble seat, radiator stoneguard, Pilot-Rays, luggage rack. – Represented as the original body and driveline. Restored in the late 80’s, CCCA Senior, class winner at Meadow Brook in 1991. The restoration was freshened within the last five years. Excellent paint, chrome and barely stretched upholstery. The underbody and chassis are better than new with minimal use and only a little age. Ready for anything except Pebble Beach. – This is an unusually pure example of one of the Classic era’s most opulent automobiles, with a known history from new and all complete and as-built, even the colors. It can only be counted as a sound value at this result and an example that should bring pride of ownership and joy of driving to its new owner. 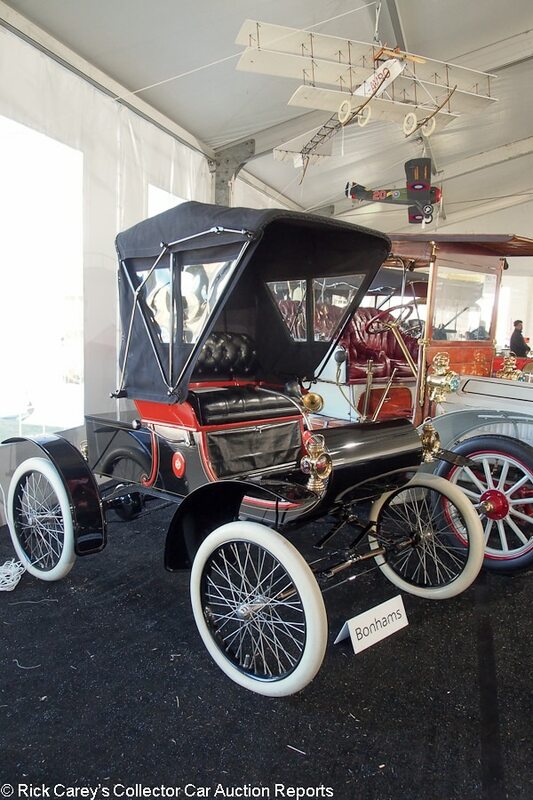 Lot # 241 1903 Oldsmobile Model R Curved Dash Runabout; S/N; Black, Red, Gold accent/Black leather; Black cloth top; Estimate $50,000 – $70,000; Older restoration, 2- condition; No Reserve; Hammered Sold at $45,000 plus commission of 12.00%; Final Price $50,400. – RHD. Tiller steering, bulb horn, Neverout kerosene lights, chrome wire wheels, white tires. – Very good older paint with some cracking panels, Sound upholstery with patina, good older top and brass. The engine and chassis are done to factory standards, not overdone. A clean and tidy Curved Dash, Brighton-ready but not VCC-dated and not showing a chassis or engine number. Don C. Boulton Collection. – This result is representative for a Curved Dash in this condition but would have been better with a more firm attribution of the relevant numbers and VCC dating to establish (or not) Brighton Run eligibility. Lot # 243 1911 Pierce-Arrow Model 48 Suburban, Body by C.P. Kimball; S/N Engine No. 8488; Engine # 8488; Dark Green, Black fenders/Black leather, Beige cloth rear; Estimate $250,000 – $350,000; Visually maintained, largely original, 4+ condition; No Reserve; Hammered Sold at $185,000 plus commission of 12.00%; Final Price $207,200. – RHD. Jump seats, pullup side windows and division, speaking tube, body color wood spoke wheels, whitewall tires, electric-bulb Klaxon horn, Solar headlights, kerosene sidelights and taillight, all electrified, Warner speedometer and clock, electric starter. – Repainted long ago and now chipped and scratched with some panel cracks. Decent brass. Torn and cracked original leather, sound but aged original rear upholstery and trim. Original chassis and engine, dry but old and a little disorganized. A marvelous old prestige automobile. Don C. Boulton Collection. – With the repaint, even as aged as it is, Preservation class wins may be a stretch but it will still be proudly displayed among other well-preserved automobiles. Restoration would erase much of its charm and significance but imagine the thrill of arriving at an opera or symphony opening night in this opulent machine. 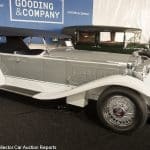 Lot # 245 1904 Peerless Type 8 24hp King of Belgium Style K; S/N; Engine # 585; Pale Grey, Red, Black accents/Dark Red leather; Estimate $400,000 – $480,000; Older restoration, 3+ condition; With Reserve; Hammered Sold at $630,000 plus commission of 10.79%; Final Price $698,000. – RHD. 24 ALAM hp T-head 4-cylinder (best guess: about 525 cubic inches), 3-speed, body color wood spoke wheels, 875 x 105 Dunlop tires, Autolyte self-generating acetylene headlights, Solar kerosene sidelights and taillight, wicker pannier and umbrella baskets, Jones speedometer, clock, folded trumpet bulb horn, electric starter and brakes, Stromberg carburetor. – Owned in the late 40’s by George Waterman, restored in the 60’s by Don Pryor. A 3-time Brighton Run veteran, VCC dating certificate 1136. Very good older paint generously chipped and touched up with mismatched paint. Sound older upholstery showing use. Decent brass needs hours with a Brasso-soaked rag. The chassis and engine are orderly but aged and driven. Don C. Boulton Collection. – This is a serious automobile with a marvelous history of careful, sympathetic ownership over decades and masses of period accessories. 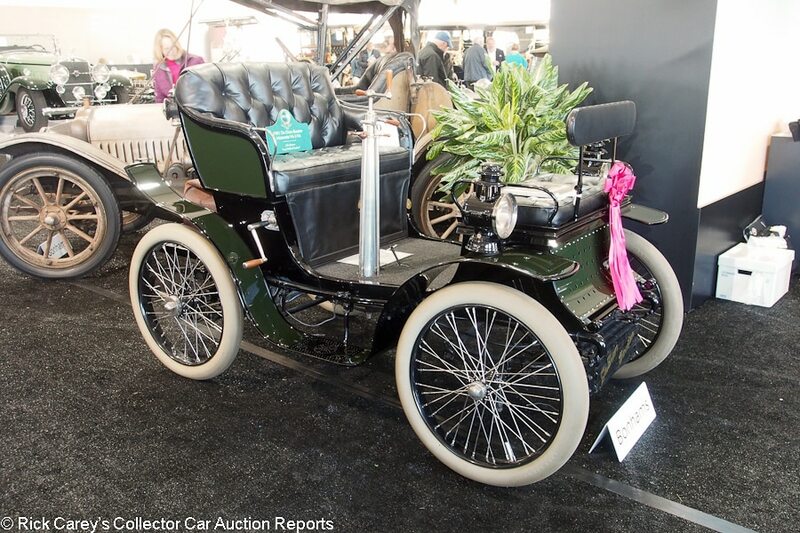 It blew the top off the pre-sale estimate range, just as the introduction of the Peerless 4-cylinder T-head engine did with the competition in 1904. Being a 1904 it will start late on the L-BVCR, but with 24hp it will finish early enough to watch the rest of the Brighton Runners arrive. It is marvelous, and it is as expensive as it (and its history) deserve to be. Lot # 247 1906 Pope-Toledo Model XII 35/40hp Roi De Belges; S/N Engine No. 35401821; Engine # 35401821; Red-Orange, Black fenders/Black leather; Black top; Estimate $280,000 – $350,000; Older restoration, 3- condition; No Reserve; Hammered Sold at $285,000 plus commission of 11.75%; Final Price $318,500. – RHD. 353/35-40hp copper water-jacketed crossflow ohv four, 3-speed, Solar Parabolens-Projecteur acetylene headlights, kerosene sidelights and taillight, bench jump seat, Solar acetylene generator, J.Unghams clock, body color wheels, white tires, single right side spare, Nonpareil folded trumpet bulb horn, Jones speedometer, double chain drive. – Part of Bob and Herb Horn’s Cars of Yesterday museum in Sarasota from the early 50’s. Restored for the Horns while still highly original under the paint and upholstery. Dull, chipped old paint, fair brass, sound upholstery. Greasy, road grimy chassis, orderly, oily engine. Well done a long time ago and obviously toured many miles since then but well- and consistently maintained, if not fluffed. Don C. Boulton Collection. – Opened on a bid of $150,000, there still were three bidders at $225,000 and the result is a tribute to the history of careful preservation and meticulous attention this Pope-Toledo has received. This is one of Don Bouton’s marvelous examples of ingenious valve operation, and one I still haven’t figured out. 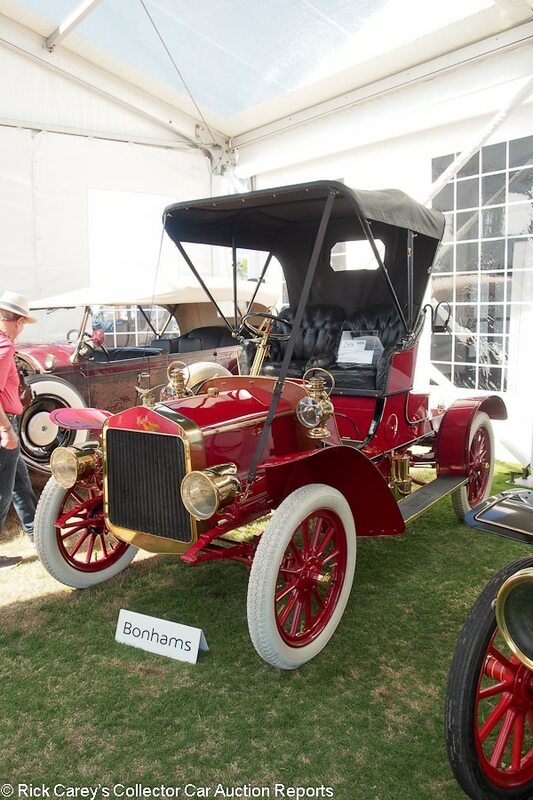 Lot # 255 1904 Haynes-Apperson Model F 18hp Twin Rear-Entrance Tonneau; S/N; Engine # 613; Burgundy, Black fenders/Black leather; Estimate $180,000 – $240,000; Concours restoration, 1- condition; No Reserve; Hammered Sold at $170,000 plus commission of 12.00%; Final Price $190,400. – Opposed 2-cylinder, 12 ALAM hp, fixed surrey style roof with brass rack, Phare Solar acetylene headlights, Dietz kerosene sidelights and taillight, bulb horn, Stewart speedometer, Phinney Walker clock, adjustable steering column, wicker pannier and umbrella baskets, cream wood spoke wheels. – Represented as the original engine, driveline and body sheet metal, one of two known survivors. Excellent paint, bright brass, excellent lightly stretched upholstery, sharp varnished wood panels. A concours restored Haynes that will still be show ready after some obsessive detailing. Not VCC dated for the L-BVCR (yet.) Don C. Boulton Collection. 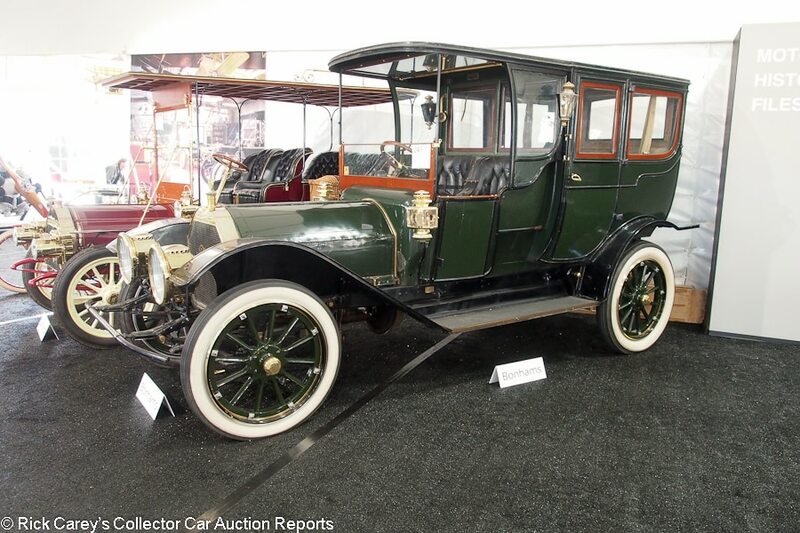 – This is one of the best condition, most recently restored automobiles from the Don Bouton Collection. The “adjustable steering column” is prescient. Hinged at its lower extremity, it rotates up and down for the driver’s comfort and dimensions. 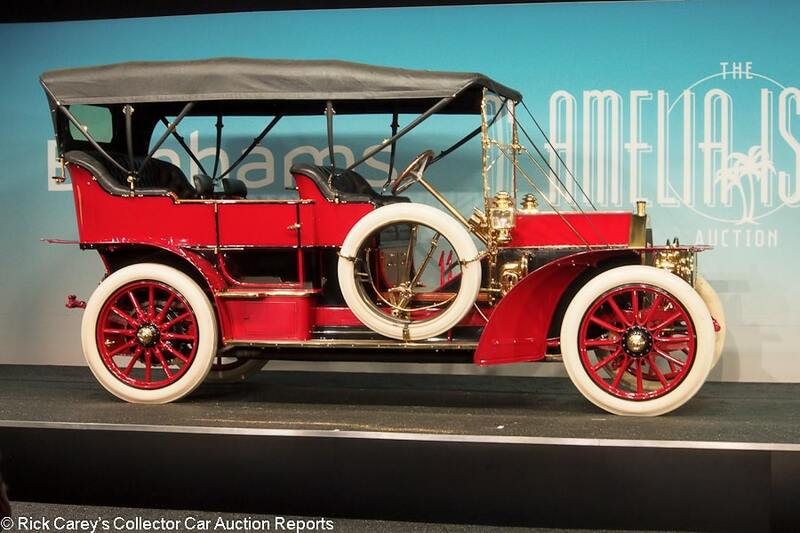 With VCC dating it might be worth more, but it’s neither fast nor an early starter and it’s pretty easily dated to pre-1905. Lavishly outfitted, the new owner can be singularly proud (or at least binary-proud) of it, and it is beautifully presented in near Pebble Beach condition. Lot # 258 1899 Knox Model A 5hp Single-Cylinder Three-Wheel Runabout; Engine # 28; Cream, Red/Black; Black leatherette top; Estimate $100,000 – $120,000; Older restoration, 3- condition; No Reserve; Hammered Sold at $95,000 plus commission of 12.00%; Final Price $106,400. – Air cooled 95 cid single, 2-speed planetary transmission, chrome wire wheels, white tires, Gray & Davis kerosene lights, wicker side and rear panels, canvas-wrapped ear tires. – Sound but chipped and dirty old paint. Grimy engine and drive. Sound upholstery and old, possibly original, leather dashboard and seat back. Restored long ago and driven. Don C. Boulton Collection. – A gasoline-powered trike with Knox’s signature pin fins, this Knox is a quandary for its new owner. It’s really good enough to be preserved and its 1899 or so date will yield an early start on the London to Brighton Vintage Car Run. Mechanically refreshed (which is about as difficult at rebuilding an early Craftsman garden tractor) it has charm and the elegance of simplicity. It’s not VCC dated but that should be no problem and the early start time and robust design is an encouraging entry. 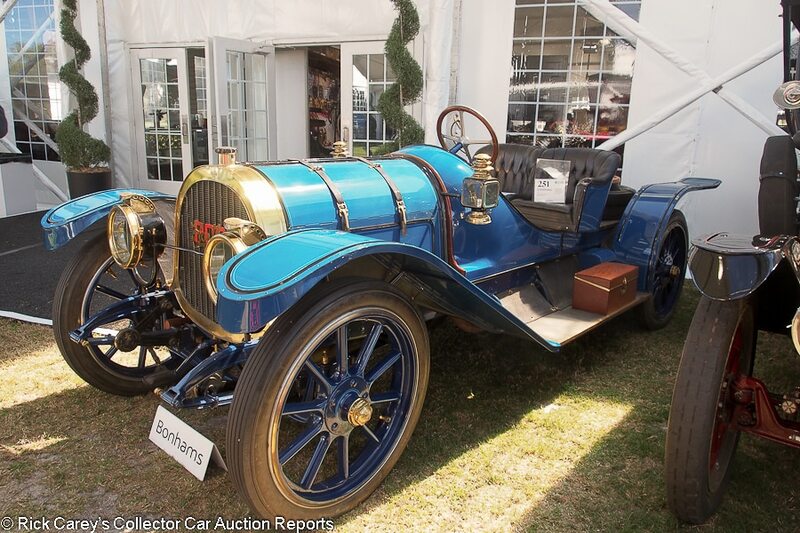 It was bought for a good price here, amongst all the Antique and Brass cars at Bonhams Amelia this year and it is realistic to characterize it as “quaint”. 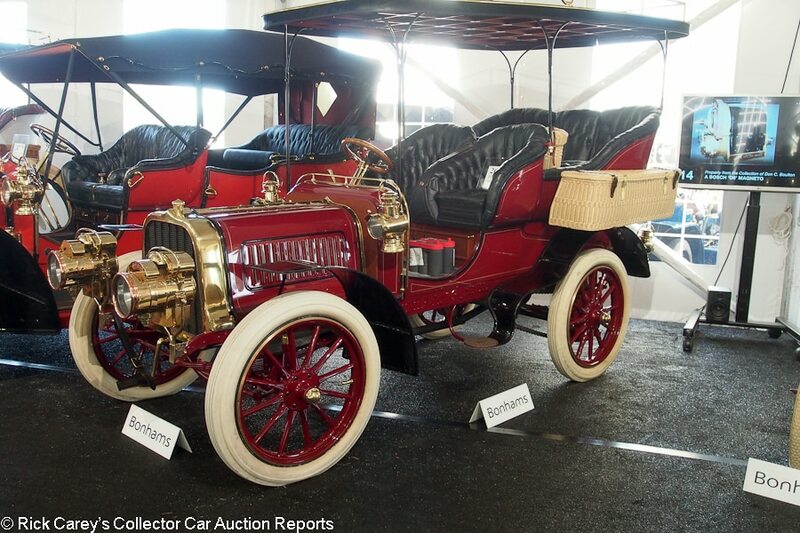 Lot # 260 1904 Pope-Toledo 24hp 4-Cylinder Rear Entrance Tonneau; S/N; Engine # 2444; Dark Red, Black patent leather fenders/Black leather; Estimate $150,000 – $220,000; Concours restoration, 1- condition; No Reserve; Hammered Sold at $120,000 plus commission of 12.00%; Final Price $134,400. – RHD. 210 cid 24hp 4-cylinder, 3-speed, copper water jackets, Warner drum speedometer, folded trumpet bulb horn, Phare Solar acetylene headlights, Neverout kerosene sidelights and taillight, cream painted wicker pannier and umbrella baskets, body color wood spoke wheels, white tires, fixed surrey style roof with brass fence, electric starter. – Re-created from Pope-Toledo parts by Stu Laidlaw .Good older paint, brass and upholstery. Orderly but aged engine compartment and chassis. A show quality older restoration displayed at Pebble Beach in 2001 with some subsequent years and miles but still shiny and pristine. Don C. Boulton Collection. – Not an early starter in the London to Brighton Veteran Car Run with 24hp and a commodious body with room for friends, this is a serious value. Bought by a television car show personality who’s been looking for a Brighton-Runner for some time, it’s a sure feature in the 2020 season of Chasing Classic Cars and a typically sound value for the new owner. 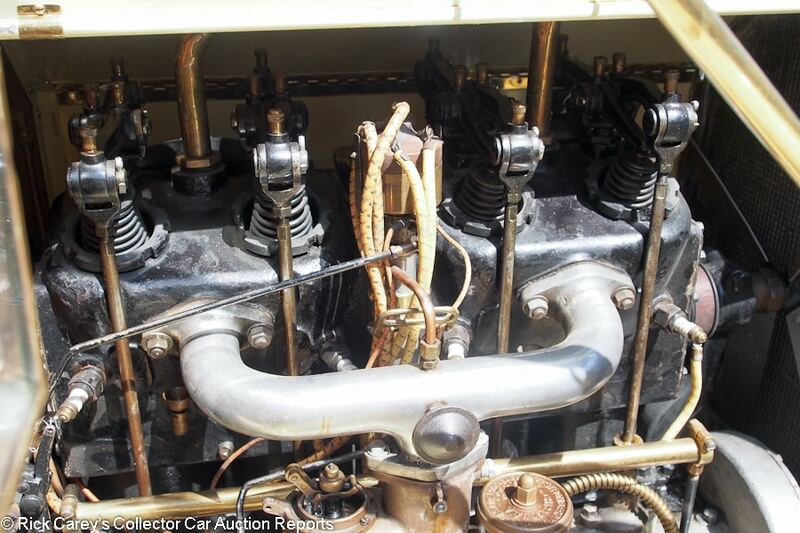 Lot # 261 1913 Mercer Type 35J Raceabout; S/N Engine No. 1462; Engine # 1462; Yellow, Black accent/Black leather; Estimate $800,000 – $1,000,000; Rebodied or re-created, 3+ condition; With Reserve; Hammered Sold at $810,000 plus commission of 10.62%; Final Price $896,000. – RHD. 301/34 ALAM hp T-head 4-cylinder, 3-speed, Fletcher carburetor, electric started, Rushmore acetylene headlights, Dietz kerosene sidelights and Dainty Tail Light, dual rear mounted spares, body color wood spoke wheels, 32×4 tires, Warner speedometer, Prest-o-Lite acetylene tank, Volier Dragon bulb horn. – A re-creation by Stu Laidlaw from “a collection of Type 35 parts acquired from Roger Ellis.” Good older paint, upholstery and brass showing age and careful use. Orderly but not pristine under the hood. A great road car. Don C. Boulton Collection. – Moved slowly by tens to $600K. Reserve off at $730K. At $795K it was bumped to $810K and took the prize. For the record, this is not the Raceabout it wants to be, but a Raceabout re-creation. 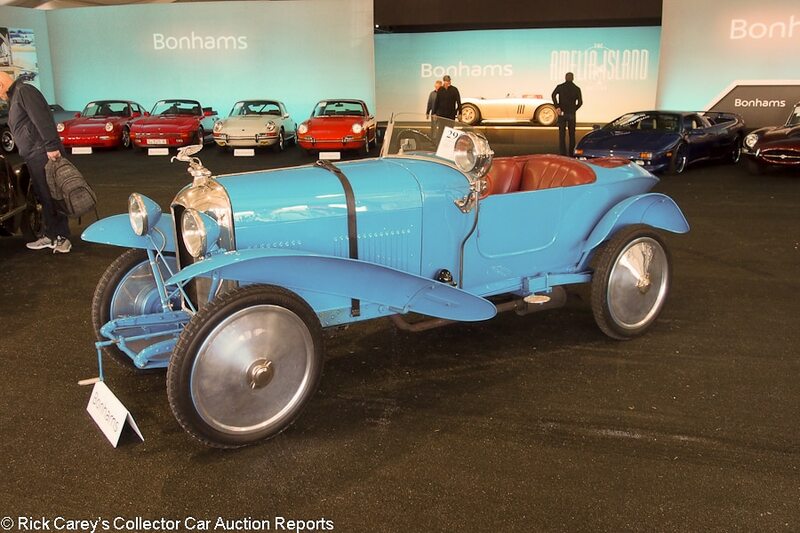 Had it been born as a Type 35 Raceabout this result would have been over $1 million, if not over $2 million depending upon its history. This is the experience: a light, lithe, free-revving T-head ending that in its day would have won races fresh off the showroom floor. The experience is worth the price it brought, and then some, and is a realistic value in a Mercer Raceabout that can be driven enthusiastically without undue concern for stone chips. 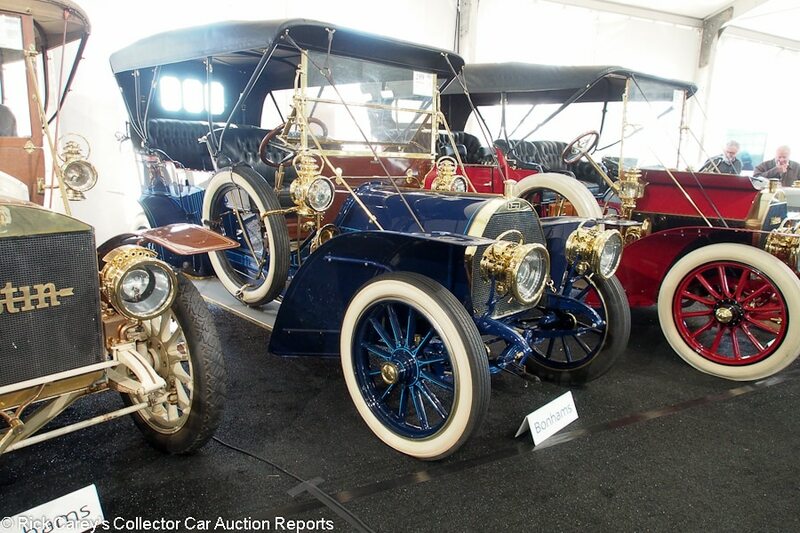 Lot # 262 1910 Pope-Hartford Model T 40hp Limousine; S/N; Engine # 6201; Dark Blue, Yellow coachline/Black leather, Blue cloth rear; Estimate $160,000 – $190,000; Older restoration, 3- condition; No Reserve; Hammered Sold at $85,714 plus commission of 12.00%; Final Price $96,000. – RHD. 299/40 ALAM hp, 3-speed, varnished wood spoke wheels, whitewall tires, single right side spare, Warner speedometer, Rubes bulb horn, Gray & Davis electrified acetylene headlights, kerosene sidelights and taillight, speaking tube, pullup side and division windows, jump seats, rollup side curtains, Hoffecker clock, electric starter. – Originally delivered with both this Limousine coachwork and a Touring body to Diego Pous in Uruguay. 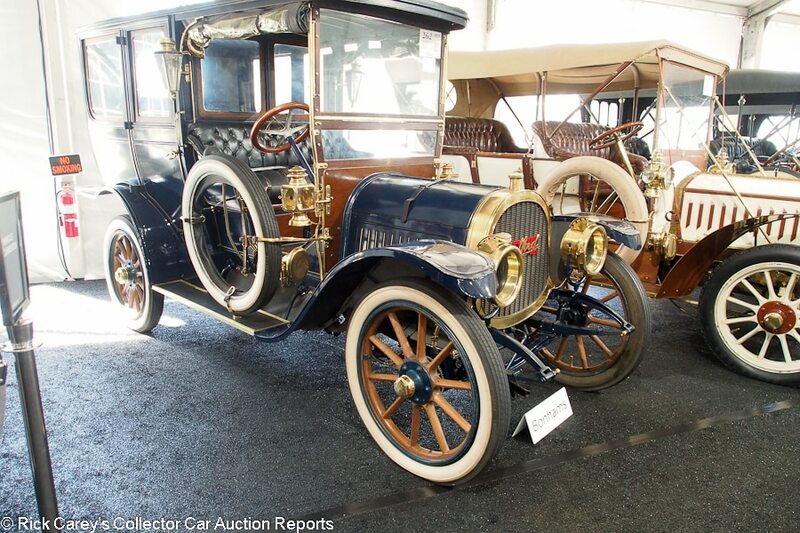 Brought back to the U.S. in 1978, the touring body was installed on another Pope-Hartford Model T. Dull old paint and varnish, erratic brass, good replaced upholstery in front, aged but sound rear. Orderly aged engine and chassis with grease and road grime. A stately and wonderfully original old automobile with honest patina. Don C. Boulton Collection. – “Restoration Project”, Oh, No, Mr. Bill. It would destroy this Pope-Hartford’s history, originality and patina. Besides, no one cares about a restored Limousine and this is a big, elegant, high quality automobile. It sold here at a post-block negotiated price that gives the new owner many ways to realize its potential, not the least of them driving it. 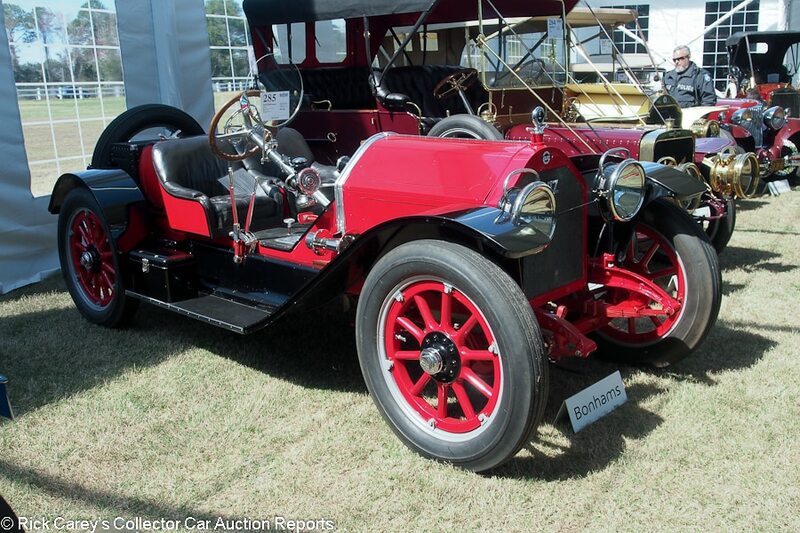 Lot # 266 1914 Simplex 50hp Speedcar; S/N Engine No. A25059; Engine # A25059; Matte Plum (or Amaranth)/Dark Plum leather; Estimate $600,000 – $800,000; Rebodied or re-created, 3 condition; With Reserve; Hammered Sold at $800,000 plus commission of 10.63%; Final Price $885,000. – RHD. 597cid/50 ALAM hp T-head four, Simplex carb, 4-speed, Badger Solarclipse headlights, double chain drive, Dark Red wood spoke wheels, White tires, Prest-o-Lite tank, dual rear spares, dual barrel fuel tanks, Klaxon electric-bulb horn, Jones speedometer, electrified headlights, Frank Winn beige cloth weather shield, Fletcher front spring shackle dampers. – An illustrious provenance including Sebring’s Alec Ulmann and Richard C. Paine. Rebodied in this style by Temple Baldwin in the 80’s. Recently recommissioned and said to run and drive well and stop if not well at least effectively. Dull paint, worn but sound upholstery, road grimy chassis and engine. Who cares? It’s a gorgeous old hunk of 50hp automobile in perfect driving condition. Don C. Boulton Collection. – The rebody retained the original hood and cowl while creating a new seating compartment and elemental rear deck in keeping with its sporting purpose. The only thing keeping it from barreling down the left lane of a modern highway is modern drivers’ lack of concern for applying their brakes faster than this bolide can possibly accommodate. Its value should be judged not on its replacement body but instead on its magnificent performance and even at this pre-sale high estimate price should not be considered expensive. Bonhams demonstrated it around the property on preview day, and the engine’s leisurely power strokes at impressive speeds were each individually obvious. 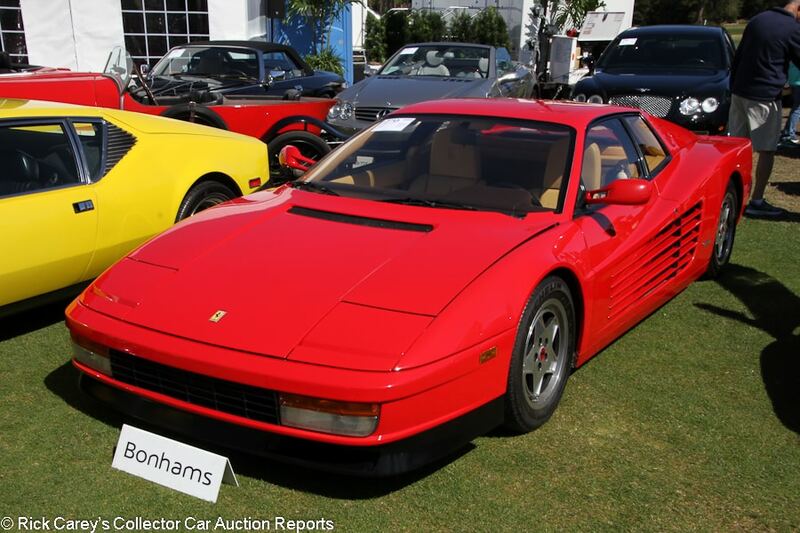 Lot # 270 1988 Ferrari Testarossa Coupe, Body by Pininfarina; S/N ZFFSG17A3J0076758; Engine # 12127; Rosso Corsa/Biscuit leather; Estimate $85,000 – $105,000; Unrestored original, 3 condition; No Reserve; Hammered Sold at $57,500 plus commission of 12.00%; Final Price $64,400. – Michelin tires, Momo steering wheel, books, tools, luggage. – Showing 38,992 miles, which is a little high in Ferrari world, although it had an engine-out service at 33,000 miles and a transmission rebuild shortly after. The paint is pretty dull (and very faded on the engine cover), and there is a small scratch below the right headlight. Lots of chips in the side strakes as well. Black paint is flaking off around the driver’s door lock. Serious wear on the driver’s seat, especially on the bolsters. The carpets are a little worn as well. Some Testarossas led the typical babied life that most Ferraris do, but some were driven a lot and not particularly carefully, either. This is one of the latter. – This is the lowest-priced Testarossa we’ve seen at auction in several years, but buyers’ indifference to less-than-perfect cars was on full display in Amelia this year and this one got little attention. 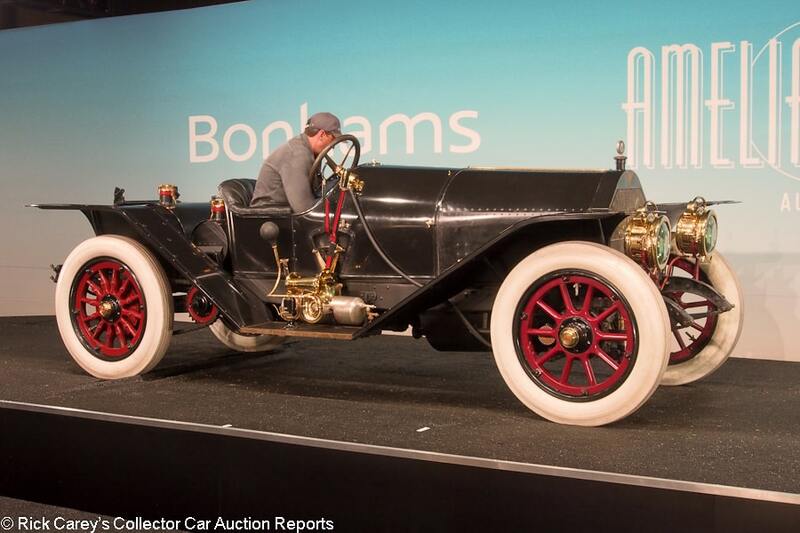 Bonhams sold it only a few months (and 20 miles) ago at Quail Lodge for $78,400. 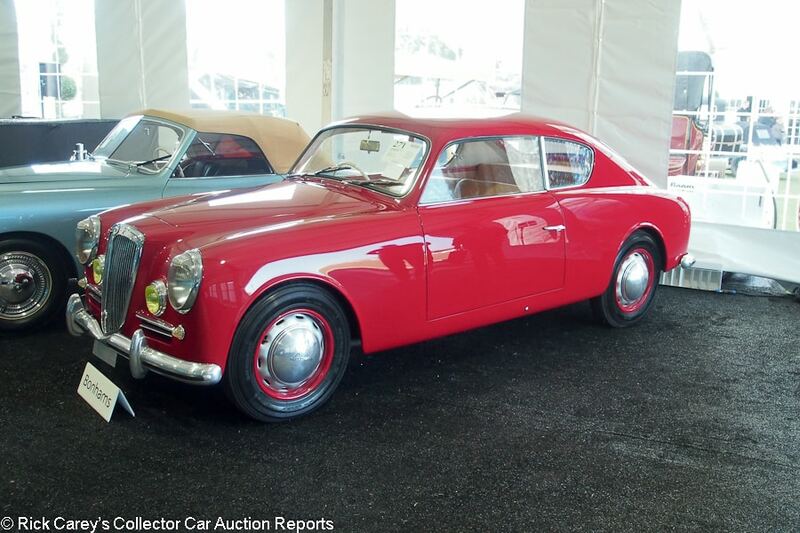 Lot # 271 1951 Lancia Aurelia B20GT Pre-Series Coupe; S/N B201047; Engine # 1001; Red/Tan leather; Estimate $175,000 – $225,000; Recent restoration, 2+ condition; With Reserve; Not sold at Hammer bid of $150,000. – RHD. 1,991/75hp, 2-barrel Weber carb, 4-speed, hubcaps, Michelin X tires, Carello headlights and fog lights, floor shift. – An early car bodied to a Pinin Farina design by either Viotti or Ghia on a subcontract. Restored in the Naughts in Italy, then cosmetically redone four years ago. Excellent paint, chrome and interior showing no wear or miles. Even gaps and flush panel fits. The underbody and chassis are like new. Bright, crisp gauges. A charming early B20GT example. – But later cars have more power and even though this example sold at the Gooding & Company Pebble Beach auction in 2014 for $192,500 ($175,000 hammer) the result here is appropriate for its performance and even its excellent presentation. Lot # 273 1992 Porsche 911 Carrera RS Coupe; S/N WP0ZZZ96ZNS491688; Engine # 62N82504; Guards Red/Black, Red; Estimate $250,000 – $300,000; Unrestored original, 2 condition; No Reserve; Hammered Sold at $165,000 plus commission of 12.00%; Final Price $184,800. – Pilot Sport tires. – Stripped European market Carrera RS model bought new by a German Porsche collector and showing 17,303 km from new. There’s not much else to report. It’s condition is mostly fantastic top to bottom, inside and out. – Built for the track, but looks like it was never taken there. It has, however, been to auction before. It sold for $239,232 at RM Paris in 2017, which was a fair result given the low miles. It should in theory be worth at least that much here in the States, where the appetite for limited-production high-performance 911s is no less voracious, so this low result was a little surprising but perhaps is the leading edge of a value realignment. At the moment it is a sweet Porsche Carrera RS at a moderate price and the exchange rate arbitrage between Paris 2017 and Amelia 2019 makes no difference. Lot # 274 1987 Ferrari 328 GTS Spider; S/N ZFFXA20A7H0070141; Oro Chiaro/Black leather; Estimate $75,000 – $100,000; Unrestored original, 3+ condition; No Reserve; Hammered Sold at $47,000 plus commission of 12.00%; Final Price $52,640. – Continental tires, Blaupunkt cassette stereo. – The caps on the wheels are a little dull and the one on the left front is cracked. A few chips on the nose but mostly very good paint in rare but not particularly pretty Oro Chiaro. The rubber trim around the roll bar and windshield is pretty dry. Lightly worn seats. Tidy underneath and represented with a service history. Showing 41,397 CARFAX-supported miles and essentially just a used 328. – This isn’t a great 328 and there likely aren’t nearly as many people who want a gold Ferrari as much as a red (or yellow, or black, or blue.) Ferrari. This was nevertheless a fairly modest result for a decent example, even more modest than the $55,000 it brought at RM Fort Lauderdale last year. 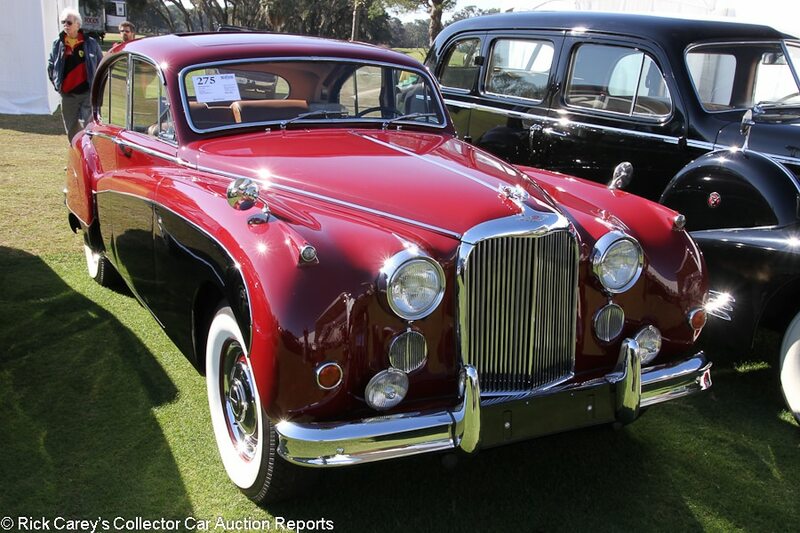 Lot # 275 1959 Jaguar Mark IX 4-Dr. Sedan; S/N 790925BW; Engine # NC37258; Red, Black/Tan leather; Estimate $40,000 – $50,000; Older restoration, 2- condition; No Reserve; Hammered Sold at $32,000 plus commission of 12.00%; Final Price $35,840. – Automatic, hub caps and trim rings, whitewalls, dual wing mirrors, Lucas driving lights, fender skirts, sunroof, original radio, automatic, JDHT Certificate. – Lightly scratched headlight bezels. Condensation behind the marker light lenses. Lightly scratched window frames. Lightly dinged body side trim. Good older paint other than some small cracks ahead of the right rear wheel. Older restored and very clean underneath. Some dull switchgear, but the leather and wood are very good. A straightforward older restoration of an inherently pretty car. Far from perfect, but still something to be proud of. – This is a realistic number for a fundamentally solid but imperfect Mk IX. Way down from the $71,500 it sold for at Mecum Monterey in 2015, but that was an over-the-top price, very much so. Lot # 277 1912 Crow-Elkhart Model 52 5-Passenger Touring; S/N 5348; Engine # 6415; Dark Blue, Black fenders/Black leather; Beige cloth top; Estimate $45,000 – $55,000; Older restoration, 3- condition; With Reserve; Hammered Sold at $54,000 plus commission of 12.00%; Final Price $60,480. – RHD. 226/26 ALAM hp side valve four, 3-speed, varnished wood spoke wheels, Non Skid tires, acetylene headlights, Castle kerosene sidelights and taillight, folded trumpet bulb horn, single right side spare, Stewart mechanical horn, Prest-o-Lite tank. – Sold when new to Mr. T.M. Hall, a horseshoe and carriage specialist in Bowman, Georgia, documented by original correspondence encouraging him to become a Crow-Elkhart dealer. There have been only three owners since Hall. Sound but dull old paint, tarnished brass. Sound old upholstery and original interior panels. Dirty. The chassis and engine have been done to serviceable touring standards. 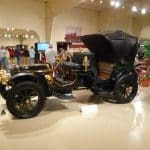 An intriguing automobile that needs pretty much everything but has a benign history of only four owners in over a century. – Exactly why someone would want this obscure marque with a mundane side valve engine and an aged restoration to the tune of $60,000 is probably not significant. It’s only enough to note that it brought this generous price. 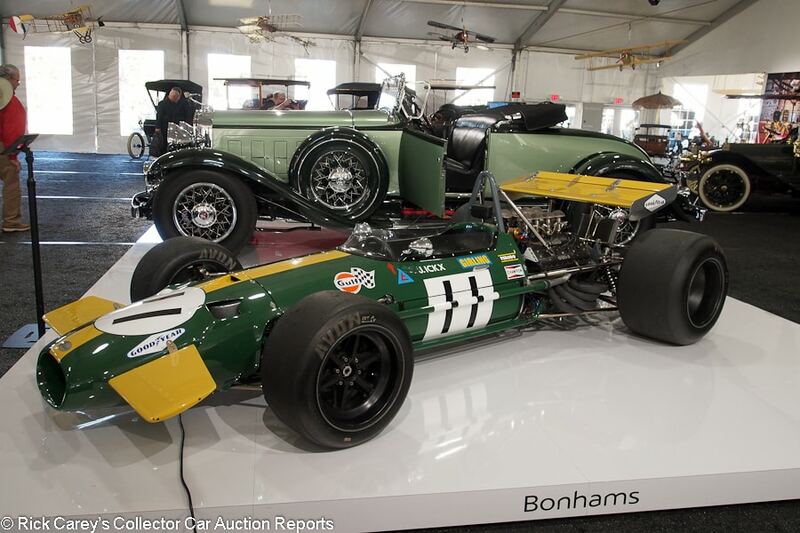 Lot # 278 1968 Repco Brabham BT26/BT26A 3-Liter Grand Prix; S/N BT263; Engine # 1986; Green, Yellow stripe and wings/Black cloth; Estimate $1,100,000 – $1,400,000; Competition restoration, 2 condition; With Reserve; Hammered Sold at $1,000,000 plus commission of 10.50%; Final Price $1,105,000. – Bolt on 6-spoke Brabham alloy wheels, Avon tires, electric starter, slide throttle fuel injection, 2,996cc Cosworth-Ford V-8, Hewland DG-300 5-speed, fire system. – 1969 Canadian GP winner driven by Jacky Ickx, this year’s Amelia Island Concours d’Elegance honoree. Several podium finishes in 1969, and a year earlier in BT26 configuration. Powered by an original Cosworth-Ford DFV. Later raced in the L&M Continental Championship by Gus Hutchison for owner Doug Champlin with two 1970 wins at Sears Point and Dallas. Restored in the early 90’s and vintage raced. Very good cosmetics and mechanical presentation. Professionally and thoroughly restored and competition prepared with scant evidence of use. A superbly usable DFV-powered Formula One car with exceptional history when new. – In today’s F1 world when the cars racing at the end of the season, supported by teams of hundreds of engineers, data specialists and elite fabricators, are bare shadows of the cars that open the season in Australia the multi-year success of cars like this Repco-Brabham BT26/26A is hard to fathom. But therein lies their fascination: simple, progressive, analog development, thoughtful concept and design by the likes of Brabham’s Ron Tauranac and determined, talented drivers like Jacky Ickx. Bought on Thursday at Bonhams, this Jacky Ickx Repco Brabham was at the Amelia Island Concours d’Elegance on Sunday, as it deserved to be, instant gratification for the new owner who didn’t pay a lot for the car, for the gratification of its Amelia display or for the enjoyment of driving it. Lot # 280 1901 deDion Bouton 5hp Motorette vis-a-vis; S/N 128; Engine # 5222; Dark Green, Black accent/Black leather; Estimate $150,000 – $180,000; Concours restoration, 1- condition; With Reserve; Hammered Sold at $145,000 plus commission of 12.00%; Final Price $162,400. – RHD. Dietz kerosene lights, chrome spoke wire wheels, white tires. – Largely U.S. built and a delightful history of its use following the San Francisco earthquake in by Dr. W.H. Crothers until it was discovered in the loft of his barn in 1944 by Alton Walker, one of the Pebble Beach Concours d’Elegance founders. Later used by MGM in the Red Skelton movie “Pardon My Dust” in the early 50’s. Restored in the early 2010’s. Second in its class at Pebble Beach in 2012 and little if any different today with very good cosmetics and a clean, barely used chassis and drivetrain. Not VCC-dated for the L-BVCR but a shoo-in. – Sold by Bonhams at Quail Lodge in 2013 for $191,400 and described as not being used since, this is a solid Brighton Run entrant with a quality Pebble Beach history and charming provenance. Its 5hp single will power it down to Brighton with remarkable alacrity, but it isn’t a bargain. Lot # 282 1983 Renault R5 Turbo 1 Hatchback; S/N 130000636; Metallic Blue/Red; Estimate $110,000 – $130,000; Unrestored original, 2- condition; With Reserve; Not sold at Hammer bid of $85,000. – 1397/210hp upgraded Tour de Course turbo four, 5-speed, Michelin TRX tires, cassette player, Renault Sport camshaft and intercooler. – A first series R5 Turbo with lightweight aluminum doors, roof and hatch. Good paint other than a single crack on the hatch near the Renault 5 badge. The driver’s side reverse light has condensation. The underbody is very clean and indicates little use despite the 90,942 km showing. The interior is very clean and free of abuse. Mechanically overhauled in 2014 but never fully restored, it’s a solid and usable example of an ’80s rally icon in great colors. – A more desirable, earlier Turbo 1-spec R5, this car has a different interior layout as well as aluminum doors, roof and hatch, so it has more in common with the actual rally cars than the later all-steel Turbo 2s and is therefore more desirable. This one sold for $80,802 at Bonhams’ Goodwood sale in 2015. The demand for rally specials has only increased since then, so the consignor was reasonable to expect more than the reported high bid, but the overall market is more soft and this may have been a missed opportunity. 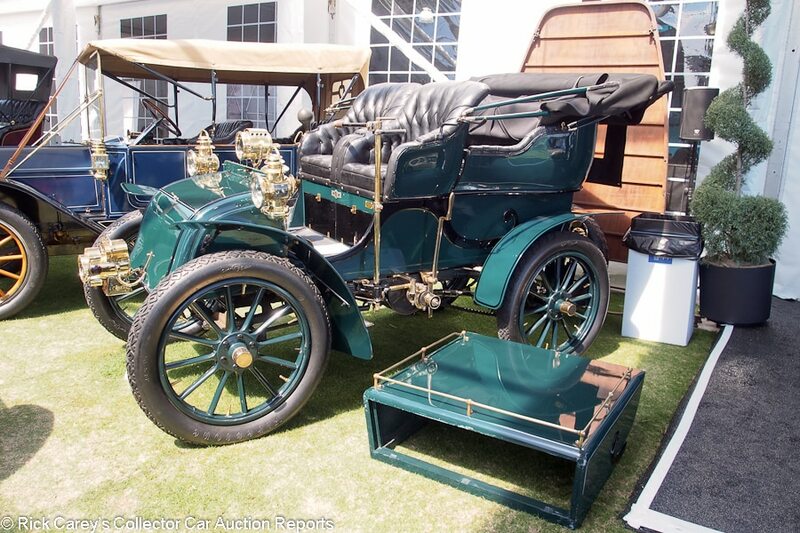 Lot # 283 1904 Knox 16/18hp “Tudor” Rear Entrance Tonneau; S/N 312; Engine # 839D; Green, Black accents/Black leather; Black cloth top; Estimate $250,000 – $300,000; Older restoration, 2- condition; With Reserve; Hammered Sold at $225,000 plus commission of 12.00%; Final Price $252,000. – Lefthand tiller steering, Neverout self-generating single headlight, kerosene sidelights, Stay-Lit kerosene taillight, body color wood spoke wheels, Non Skid tires, single chain drive, acetylene searchlight, removable tonneau, flat rear deck to replace it, unfinished full-length teardrop roof. – Old dry rotting tires. Sound but aged paint and upholstery. Uneven brass. Some miles on the engine and chassis. Some cracked wood panels. Not fresh, but concours restored a while ago and Brighton eligible. – If nothing else this Knox has an informative auction history. While not changing its condition much at all, it sold for $198,000 at Gooding’s Pebble Beach auction in 2012, then $192,500 at Bonhams Quail in 2015 before jumping upward at Bonhams Amelia in 2017 with a sale of $292,600. No one seems to have done anything with it except for Barry Hon’s entry in the L-BVCR in 2013 and an L-BVC Run in 2016 with regular mechanical attention for its reliability. The result here, as in 2017, may be seen as a testament to its reliability and L-BVCR eligibility. Lot # 285 1913 Stutz Series A Bearcat Speedster; S/N 911; Engine # 5855; Red, Black fenders/Black leather; Estimate $250,000 – $350,000; Rebodied or re-created, 3 condition; No Reserve; Hammered Sold at $180,000 plus commission of 12.00%; Final Price $201,600. – RHD. 16-valve T-head Wisconsin 389 cid engine, 60 ALAM hp, 3-speed, monocle windshield, electric lights, luggage trunk, single rear spare, Red wood spoke wheels, barrel fuel tank, Tuto electric horn, Warner speedometer, electronic ignition, 12-volt electrics. – Assembled from parts of various sources by Paul Freehill in the 90’s for Robert Randolph. Sound older paint, upholstery and brightwork. Chipped and scratched throughout from enthusiastic use. Presentable and usable but not fresh by miles. – It is disingenuous to describe this Bearcat as a “resto-mod” but it is tempting. Like many charming and exhilarating cars of its era, it disappeared as an entity and was brought back to life as what Denis Jenkinson would describe in his “Directory of Historic Racing Cars” as a “resurrection”: it never existed like this in the Teens, but it fairly and reasonably represents what it might have been then. Either way, it’s a nifty piece of open road motoring for which a magnanimous but not unrealistic price was paid. Lot # 288 1907 Buick Model G Roadster; S/N 4289; Engine # 7592; Red, Black accents/Black leather; Black leatherette top; Estimate $75,000 – $95,000; Older restoration, 2- condition; With Reserve; Hammered Sold at $52,500 plus commission of 12.00%; Final Price $58,800. – RHD. Gray & Davis acetylene headlights and generator, Gray & Davis kerosene sidelights and taillight, Stewart clock, Jones speedometer, folded trumpet bulb horn, body color wood spoke wheels, white tires, side curtains. – Sound and presentable old paint, bright brass, good top and upholstery. One dent in the radiator and some paint substrate issues on the hood. Clean, orderly chassis and engine. Restored to show quality standards and showing age but negligible evidence of any significant use. – General Motors was built on Buick and its moderately-priced, high quality product offering. Buick also featured importantly in the career path of many of the American automobile industry’s giants like Walter P. Chrysler and Charlie Nash. 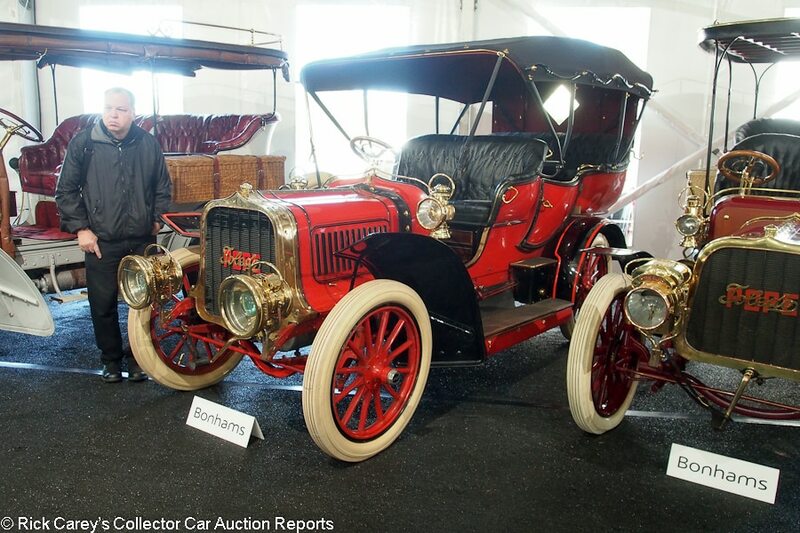 Buick’s historical importance makes even a modest early Buick like this 2-cylinder Model G a significant automobile and a realistic retail value at this price. 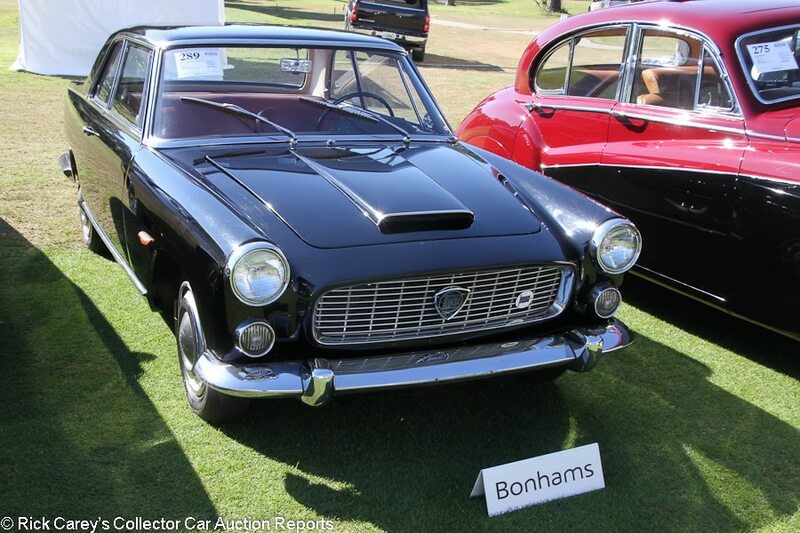 Lot # 289 1962 Lancia Flaminia Coupe; S/N 823024290; Engine # 5874; Black/Red leather; Estimate $35,000 – $45,000; Visually maintained, largely original, 3+ condition; No Reserve; Hammered Sold at $20,000 plus commission of 12.00%; Final Price $22,400. – 2458/119hp V6, 4-speed, hub caps, Michelin X tires, single Weber carb, Becker Europa radio. – Mostly original other than a recent overhaul of the engine and a much older repaint over the original silver. Dull and lightly scratched but presentable chrome, although there’s a sizable crack in the right headlight bezel. The repaint is so old that it looks original and, being black, it shows every flaw. There are numerous light swirls and scratches all over. The taillight lenses are cracked. The leather is aged but there are impressively no rips or cracks. The gauges are clear and the switchgear is clean. The hubcaps are beat up, but the underbody is tidy and dry apart from some light dirt and grime. A handsome, well designed classic Lancia that has been reasonably well preserved and would make a straightforward project. – The ideal future for this Flaminia is to continue to preserve, maintain and drive it, a choice that is even more rewarding than undertaking an expensive restoration with little recompense. Lot # 291 1907 Cadillac Model K 10hp Tulip Roadster; S/N 24306; Dark Red, Red chassis, Black fenders/Black leather; Black leatherette top; Estimate $55,000 – $70,000; Older restoration, 2- condition; With Reserve; Hammered Sold at $40,000 plus commission of 12.00%; Final Price $44,800. – RHD. E & J acetylene headlights, kerosene sidelights and taillight, folded trumpet bulb horn, single chain drive, Red wood spoke wheels, whitewall tires. – Sound old paint with some small touched up chips and dulling. Tarnishing brass. Clean, orderly chassis and engine. Good top and upholstery. Show quality restored a long time ago, showing age but little use after its most recent long term static display but running and driving. – This is one of most important models in Cadillac history. Three Model Ks were disassembled by the Royal Automobile Club, then reassembled after mixing their parts and run on an extended demonstration at Brooklands, demonstrating Cadillac’s precision manufacture, winning Cadillac the RAC’s 1909 Dewar Trophy, and establishing Cadillac as “The Standard of the World”. The condition of this Cadillac’s old restoration is highly impressive and the knowledgeable bidders at Bonhams Amelia paid a realistic price for it. 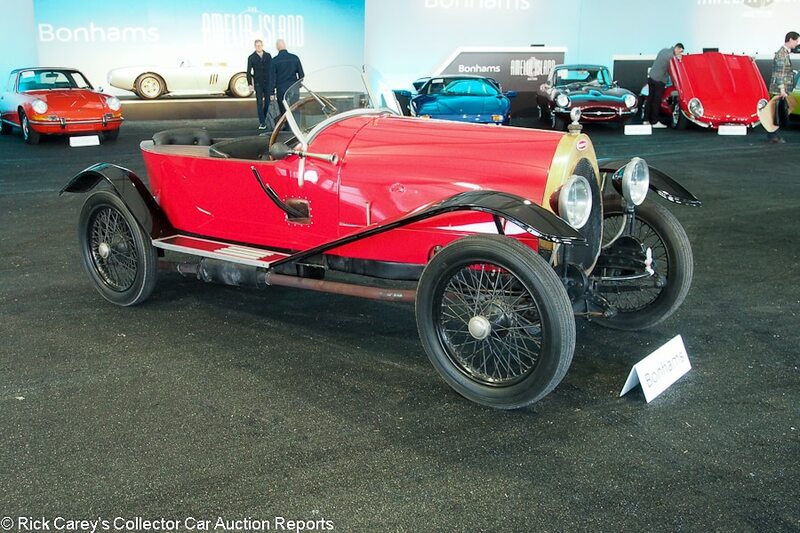 Lot # 292 1923 Amilcar CGS 3-seat Torpedo, Body by Kellner; S/N CGS7385; Blue/Maroon leatherette; Estimate $80,000 – $95,000; Older restoration, 3+ condition; With Reserve; Hammered Sold at $80,000 plus commission of 12.00%; Final Price $89,600. – RHD. Centerlock wheels with polished discs, SDGD speedometer and clock, clamshell fenders, Alerio spotlight vee windshield, Dunlop motorcycle 26×3 tires, Imperator bulb horn. – Good paint, chrome and interior. Good older restored engine and chassis. Engine leakage stains on the left chassis rail. A handsome little runabout for tours and events with Pebble Beach Concours d’Elegance history in 2004. – Attractive, thoroughly restored, well-maintained and usable, this is a good little car for a modest but appropriate price that is well-suited to many events and even vintage racing, or just a joyous romp on a good day and a winding road. 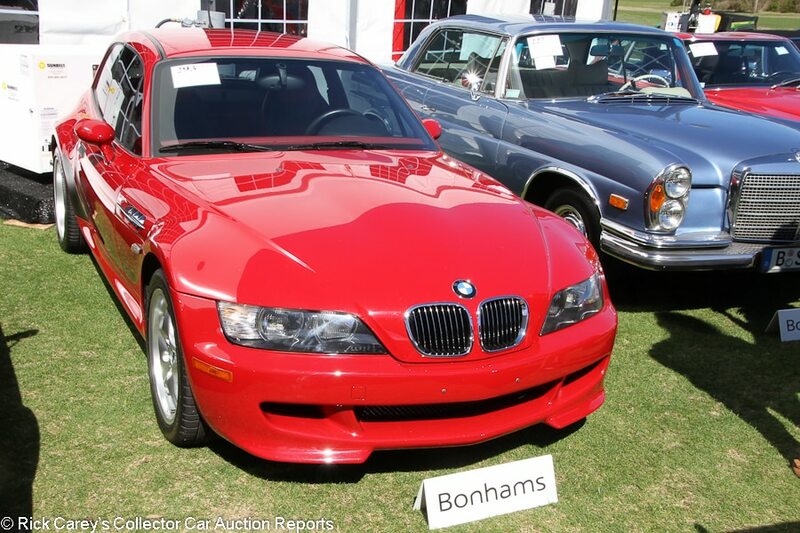 Lot # 293 2000 BMW Z3 M Coupe Hatchback; S/N WBSCM934XYLC61257; Imola Red/Black, Red leather; Estimate $45,000 – $55,000; Unrestored original, 2- condition; No Reserve; Hammered Sold at $35,679 plus commission of 12.00%; Final Price $39,960. – 3246/240hp S52 engine, 5-speed, alloy wheels, CD stereo, power windows, heated seats, limited slip axle. – This is the less powerful S52-powered M Coupe, but still neat. Lots of small rock chips on the nose and the front of the hood. Otherwise no big blemishes in the paint. Very good interior. Clean underneath. The paint should be better on a 20-year old car with 16,100 miles on it and it does have the less desirable engine, but any `clown shoe’ M Coupe is desirable and this is not at all a bad car. 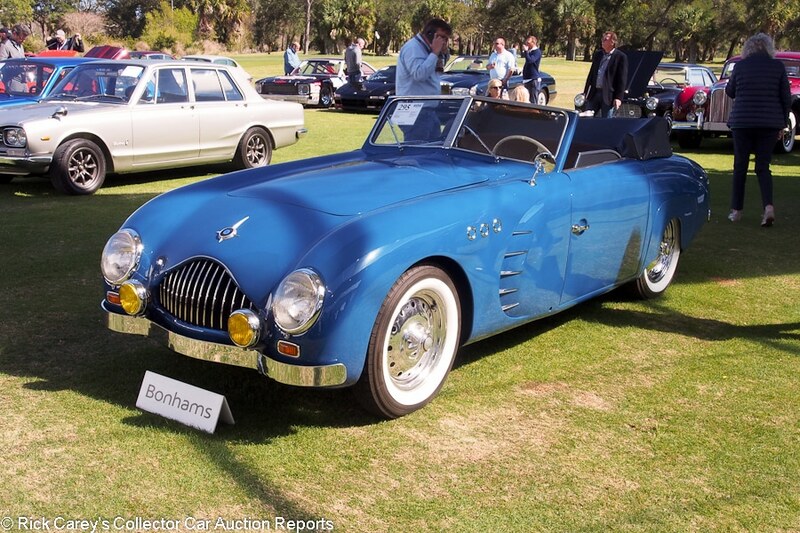 – Other M Coupes have sold for more, including a $56,000 car in the same colors at Bonhams Scottsdale in January. Given this one’s less than immaculate presentation and lower-spec engine, however, this result makes sense and it’s still less than the car would have cost new. 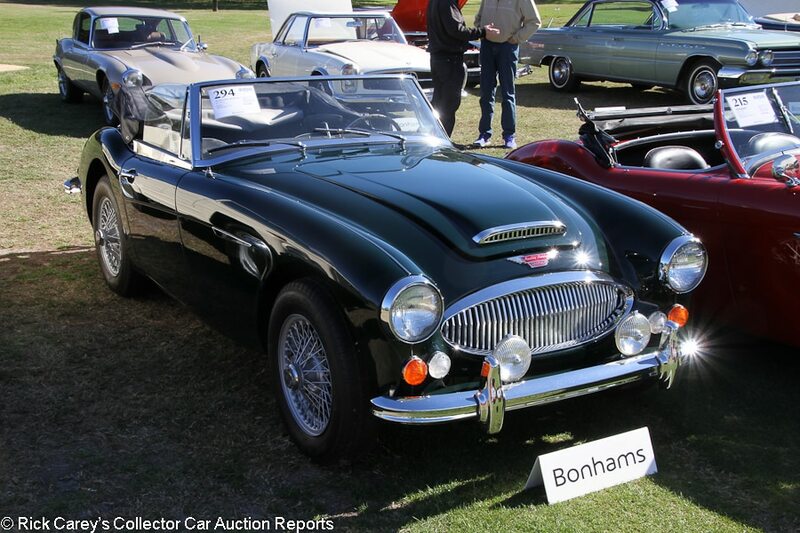 Lot # 294 1967 Austin-Healey 3000 Mk III Phase 2 Convertible; S/N HBJ8U42311G; Engine # 29KRUH16897; British Racing Green/Black; Black top; Estimate $70,000 – $90,000; Older restoration, 3+ condition; No Reserve; Hammered Sold at $38,000 plus commission of 12.00%; Final Price $42,560. – Phase 2, overdrive, painted wire wheels, boot cover, Moto-Lita woodrim steering wheel, Blaupunkt pushbutton radio, Lucas driving lights, BMIHT Certificate. – Lightly scratched hood scoop trim. The headlight bezels don’t fit straight. The windshield gasket is dry and there are scratches at the top of the frame. Even body gaps. Tidy older restored underneath. The steering wheel looks a little dry and worn but the rest of the interior is good. Sound older paint and chrome. A restored final year Big Healey, but showing its age and not a whole lot better than your average driver. – Even for a driver quality car, this is a modestly priced final year Big Healey and a lot of car for the money. 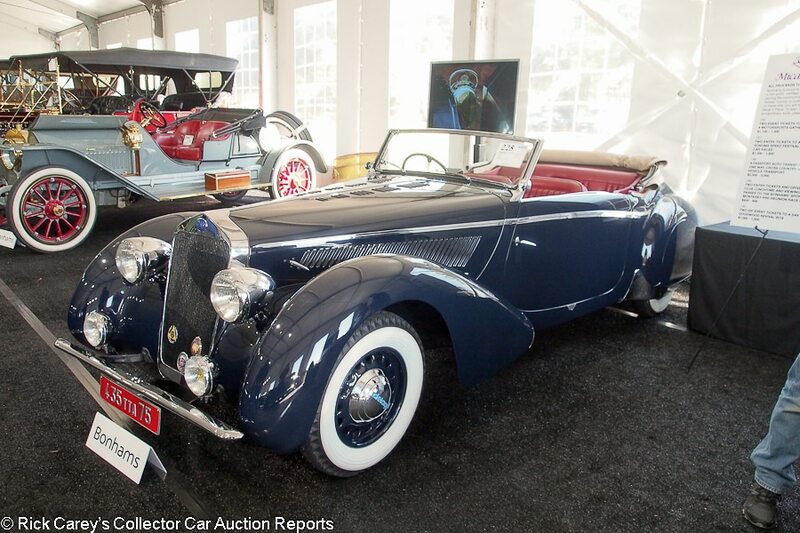 Lot # 295 1950 Veritas Scorpion Cabriolet, Body by Spohn; S/N 5095; Engine # 73095; Blue/Brown leather; Dark Blue cloth top; Estimate $350,000 – $450,000; Older restoration, 2- condition; With Reserve; Not sold at Hammer bid of $310,000. – 1,988/90hp BMW 328 engine, 4-speed, independent front suspension, deDion rear suspension, Bosch headlights and fog lights, fender skirts, whitewalls, chrome centerlock disc wheels, tinted sun visors. – The engine bay is a little grimy but presentable. Badges are a little faded. Good but orange peely older paint and chrome. Good lightly worn and surface cracked upholstery, scraped steering wheel rim. Restored many years ago and more recently cosmetically freshened by BMW Classic. Strangely styled and larded up with gewgaws and fussy features, but very distinctive and impossible to ignore. – Reported bid to $450,000 at Bonhams Quail Lodge auction last August, even with a drastically lowered estimate range this Veritas failed to attract sufficient interest here at Fernandina Beach and once again went unsold. It is a peculiar car, with an even more peculiar design with more in common with California customs of the period than with European design. It might be argued that a Veritas belongs in a serious BMW collection, but it might also be argued that it doesn’t and it will take a rare combination of open-minded collectors to find it the right home that meets the consignor’s value expectations. 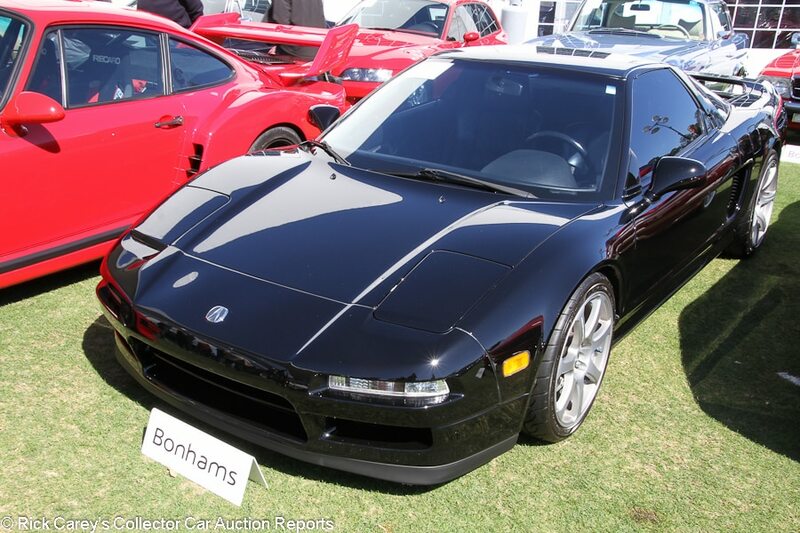 Lot # 296 1991 Acura NSX Coupe; S/N JH4NA1154MT001707; Stealth Black/Black leather; Estimate $55,000 – $75,000; Unrestored original, 2- condition; No Reserve; Hammered Sold at $46,000 plus commission of 12.00%; Final Price $51,520. – Workenmotion aftermarket alloy wheels, Yokohama tires, tinted glass, cassette stereo. – An early NSX with 39,150 miles – high for an exotic but barely broken in for a VTEC Honda. The paint is pretty good with a handful of small chips on the nose, a few more on the mirrors, and light detail scratches throughout. Lightly worn seats and shift knob but mostly good interior. Tidy underneath. Not an immaculate time capsule car, plus it has incorrect wheels, but nevertheless a well-kept example that likely has nowhere to go but up in value. – Where values are currently, this is a spot-on result for a good but used early NSX. 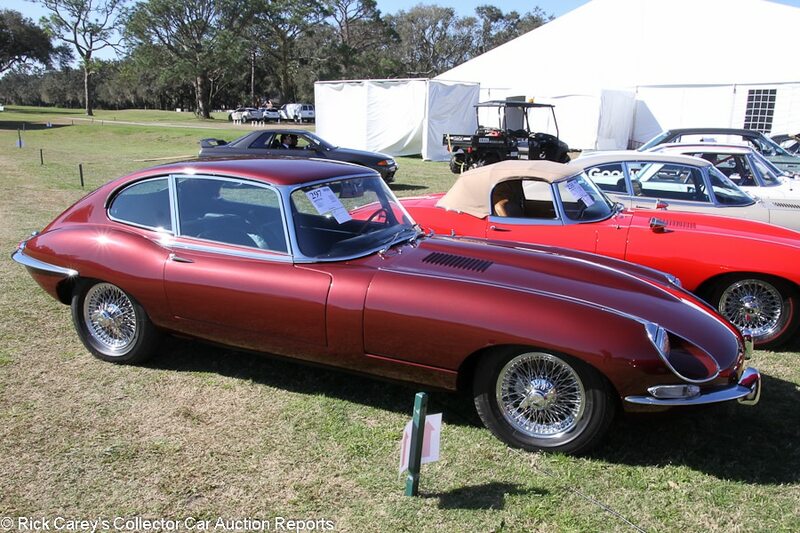 Lot # 297 1967 Jaguar XKE SI.5 Coupe 2+2; S/N 1E77750; Engine # 7E538449; Opalescent Maroon/Black leather; Estimate $45,000 – $65,000; Older restoration, 2- condition; No Reserve; Hammered Sold at $31,000 plus commission of 12.00%; Final Price $34,720. – 4-speed, chrome wire wheels, Michelin XVS tires, woodrim steering wheel, factory radio, JDHT Certificate. – Represented as matching numbers. Very good older paint and chrome. Light scratches on the window and windshield frames. Lightly worn older leather and original steering wheel but mostly good interior. Clean underneath. A lightly used older restoration. Some colors do the less elegant 2+2 body style more justice than others, and luckily this is one of those colors. 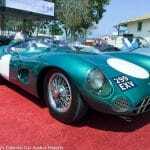 – There were five E-Types at this auction, including three more desirable Series I cars, so this car failed to excite and wound up at a price that ordinarily buys a much worse car. It was reported bid to $29,000 at Mecum’s Spring Classic in Indianapolis in 2013. The new owner has a solid car with plenty of money left over to fix any issues. 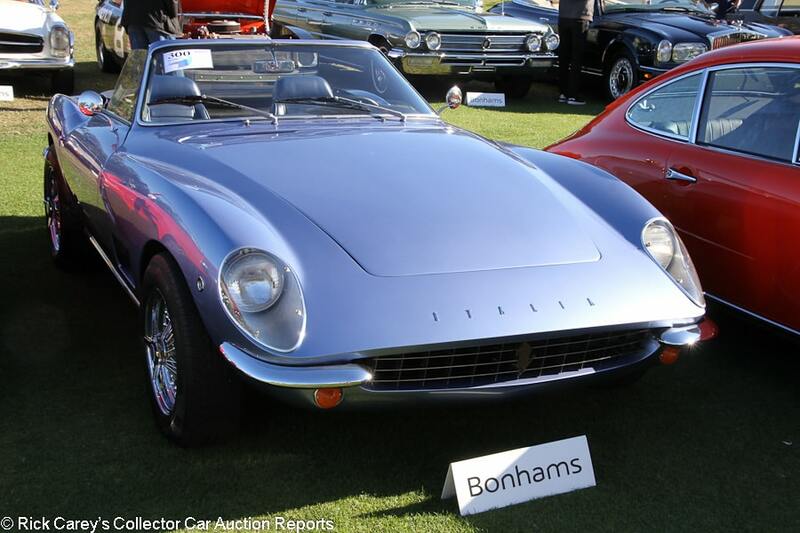 Lot # 300 1971 Intermeccanica Italia Convertible; S/N 50367414; Portofino Blue Metallic/Blue leather; Dark Blue cloth top; Estimate $125,000 – $175,000; Cosmetic restoration, 3+ condition; With Reserve; Not sold at Hammer bid of $115,000. – 351/300hp Ford, chrome wire wheels, Pirelli P4 tires, Tremec 5-speed, leather-wrapped steering wheel, power windows, aftermarket stereo. – Uneven fit on the hood. Lightly scratched headlight lenses and the frames are cracked. Good, clean newer wheels. High quality paint, but there is a long scratch on the right rear fender. Light road wear underneath. The wood on the console is cracked and the door panels are pretty worn, but the rest of the interior is sound and presentable. A solid but superficially restored example of this neat Italo-American hybrid. The added 5-speed is more valuable for its driving practicality than the knock it puts on originality. – Italias look and go like a much more valuable Italian thoroughbred, and they’re easier to keep running, so they have a lot going for them. This one isn’t really worth any more than the reported high bid, though, and for reference it sold at RM Fort Lauderdale last year post-block for $103,000. It hasn’t had any serious work since then other than a new set of wheels and general cleaning, so the offer in Amelia could have seen it off to a new home. 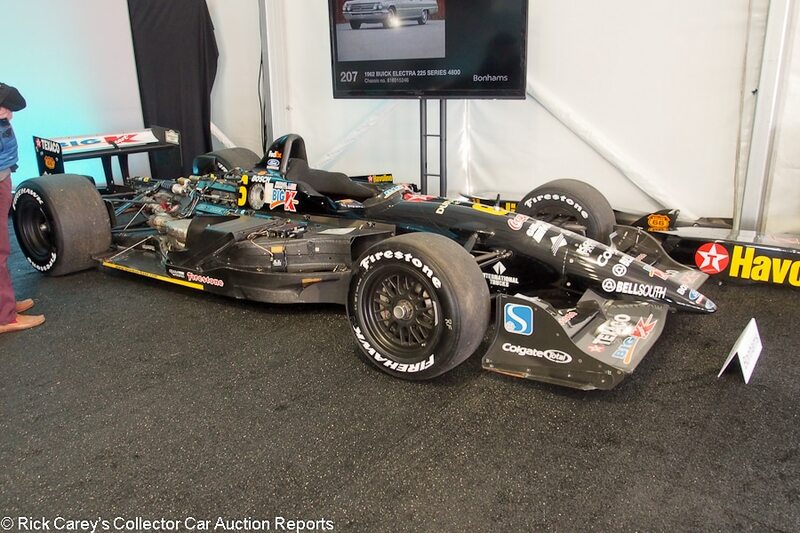 Lot # 301 1999 Swift/Ford-Cosworth 010C Indy Car; S/N 008; Engine # XD037; Black, Texaco Havoline, Big Kmart /; Estimate $100,000 – $150,000; Competition car, original as-raced, 3 condition; No Reserve; Hammered Sold at $50,000 plus commission of 12.00%; Final Price $56,000. – 2,650/829hp Ford-Cosworth XD, Hewland 6-speed, black alloy centerlock wheels. – Driven by Michael Andretti in 20 races in 1999 with one victory (Gateway), five podium finishes and 4th for Andretti in the driver’s championship with Newman/Haas Racing. Raced in Europe’s BOSS series in 2004 by Mike Biangardi with two podium finishes. Stored since then. Mostly as-raced, clean and orderly but definitely used. Appears to be complete except for radio equipment. – At this price the new owner might be able to afford the complex and expensive task of re-commissioning this Swift for the track but even if it’s just left alone as garage art it is a sound value for the money. The Big KMart livery of product sponsors (Coca Cola, Gillette, Glade, Kodak, Sprint, Bell South, Colgate, etc.) is a snapshot of American retail brands, some now gone forever, of the late 90’s. Lot # 304 1969 Nissan Skyline 2000 GT-R 4-Dr. Sedan; S/N PGC10000565; Silver/Black; Estimate $150,000 – $180,000; Visually maintained, largely original, 2- condition; No Reserve; Hammered Sold at $116,071 plus commission of 12.00%; Final Price $130,000. – 1990/160hp, three 2-barrel Weber carbs, 5-speed, alloy wheels, dual wing mirrors, racing cams, racing manifold, stainless steel exhaust, aluminum radiator, Nardi steering wheel, books and tools. – One of 832 sedans, which are rarer than the two-doors. Featured on Jay Leno’s garage. Very good paint, but the window seals appear old. The bumpers and trim are generally good. The deck lid badging as well as the front and rear GT-R badges appear to have been repainted by an amateur. The underbody is clean and restored and the interior shows little use. The engine bay is nearly spotless and features light, tasteful mods. Never restored because it never needed to be, but got major attention when necessary and a series of modifications. – A post-block concluded transaction, this is a largely unassisted analog high performance sedan with impeccable credentials, the 300 SEL 6.9 of Japanese sedans. Usually extensive modification such at this car has are an impediment to value but the Bonhams Amelia bidders realized the endorphins hidden under the hood and in the chassis and claimed it for a realistic price. Lot # 305 2001 Rolls-Royce Corniche Convertible Coupe; S/N SCAZK29E31CX68509; Dark Blue/Beige leather piped in Dark Blue; Estimate $120,000 – $160,000; Unrestored original, 2- condition; With Reserve; Not sold at Hammer bid of $95,000. – 6750/325hp turbo, automatic, Avon tires, power everything, – Represented as one of 374 built and with 7,000 miles. Very small scrape on the left front fender and some light detail scratching on the brightwork, but the body mostly looks great with a bright metallic shine. Lightly worn driver’s seat but mostly very good interior with a forest’s worth of wood. Light curb rash on the left front wheel. Not quite like new, even though it really should be given the low odometer reading. 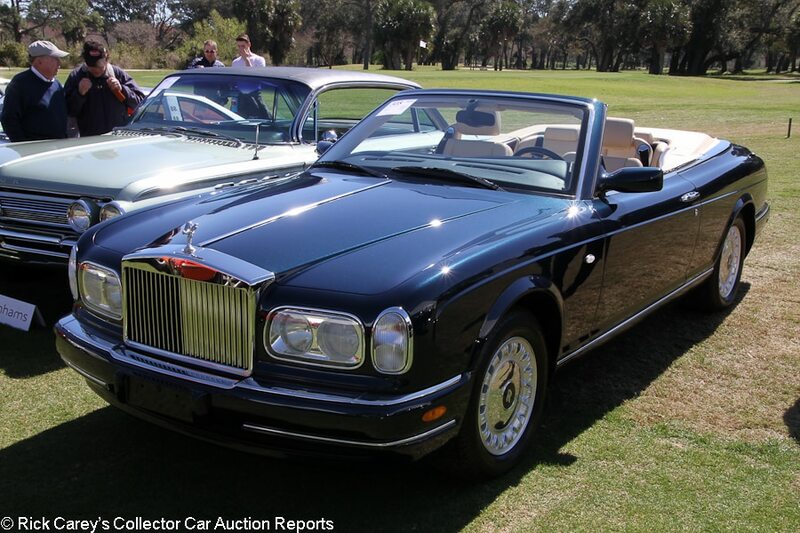 – One of the last Rolls-Royces to have the company’s proprietary V-8 before BMW units made their way under the hood, this Corniche would have cost nearly 400 grand when it was new. Any late-model Rolls has depreciated significantly, though, and despite this one’s low miles it’s probably not worth much more than the reported high bid. Lot # 306 1939 BSA Scout Roadster; S/N E2196; Engine # A4363; Light Blue, Black fenders/Black vinyl; Black cloth top; Estimate $20,000 – $25,000; Cosmetic restoration, 3 condition; No Reserve; Hammered Sold at $15,000 plus commission of 12.00%; Final Price $16,800. – RHD. Black steel spoke wheels, Excelsior tires, chrome headlights, trafficators 4-spoke banjo steering wheel, side valve 1,203cc 4-cylinder, front wheel drive, 3-speed. – Chipped but sound body paint, cracked and blistered fender paint. Good interior wood, upholstery and top. Aged engine and chassis. Erratic chrome. Unusual but with many needs and barely a usable driver. – As pre-war British lightweight sports cars go this is a thoughtful value that will have MG owners checking it out closely (if surreptitiously) at any British gathering. It’s also likely to be the only BSA Scout there. 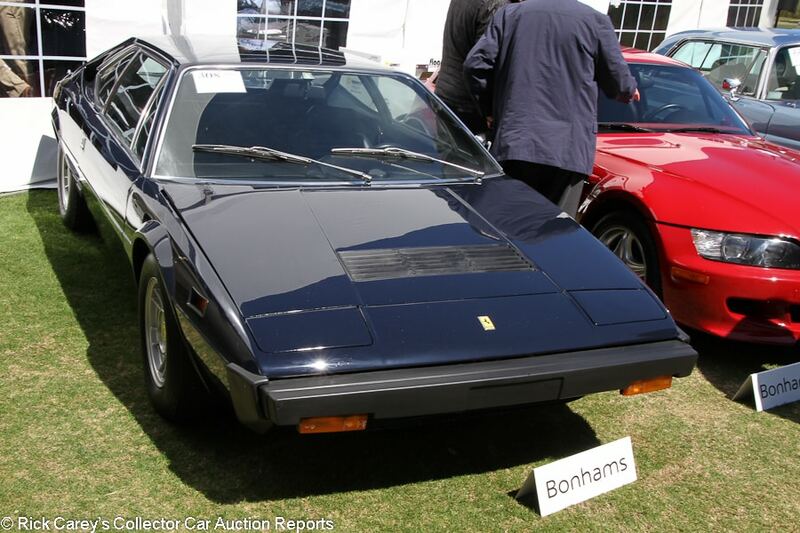 Lot # 308 1975 Ferrari 308 GT4 Dino 2+2 Coupe, Body by Bertone; S/N 10196; Dark Blue/Dark Blue leather; Estimate $45,000 – $65,000; Unrestored original, 3- condition; No Reserve; Hammered Sold at $34,000 plus commission of 12.00%; Final Price $38,080. – Cromodora wheels, Michelin XZX tires, Momo steering wheel, power windows, air conditioning, Blaupunkt cassette stereo, books and tools. – All original and showing 36,854 miles. Recent service, including belts. Dull plastic bumpers with some cracks on the rear. Dull paint with two sizable cracks behind the right window. Worn interior with rough seats and a big rip on the driver’s side. Represented with a recent service, but the 308 GT4 was a budget Ferrari for decades and lots of them weren’t all that well taken care of. This one’s presentation isn’t reassuring. – There’s no such thing as a ‘cheap’ Ferrari anymore, but the 308 GT4 is among the least expensive tickets to Ferrari ownership. This is about the bottom end of the price spectrum for a passable GT4, but no less than this sketchy example really deserves. Lot # 309 1966 Meyers Manx Dune Buggy; S/N M1769D826S; Golden Metallic/Black vinyl; Estimate $25,000 – $35,000; Older restoration, 2- condition; No Reserve; Hammered Sold at $27,500 plus commission of 12.00%; Final Price $30,800. – Unspecified single carburetor VW engine, 4-speed, hub caps, roll bar, Empi steering wheel, modern VDO gauges, Meyers Manx Registry authenticated #610. – Mostly stock engine with original Solex single-barrel. High quality metallic paint, but there is a long scratch on the passenger’s side. Very clean underneath but not spotless and perfect, and something looks off about the left rear crossmember, a little bent. Very good interior. A genuine Manx, not perfect, but with tons of charm and looks like the most fun car here. 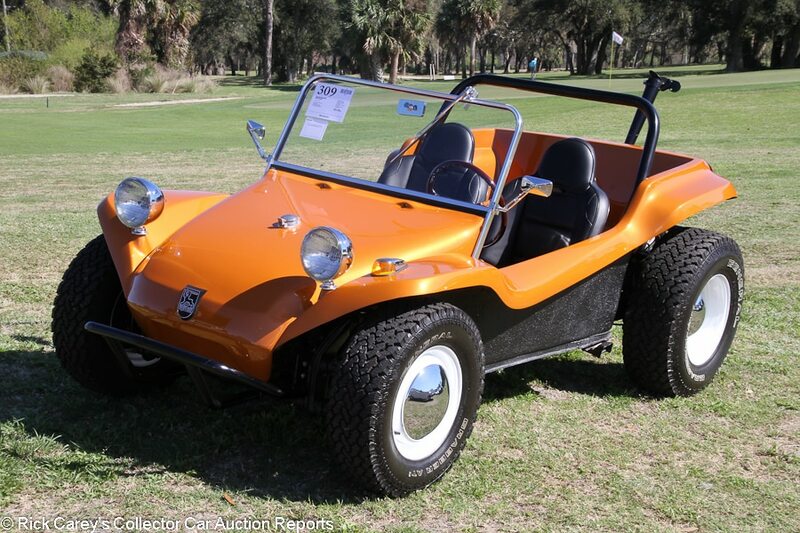 – Conceived by Bruce F. Meyers in the early 60’s, the Manx on its shortened VW Beetle floor originated the Dune Buggy. Real Meyers Manx Dune Buggies are rare today, having been emulated by many pretenders over the years and driven into decline over roads, dunes and deserts. This example as an authenticated Meyers Manx is rare and desirable and is a seriously good value even at this moderately over low estimate price. It promises to be more fun than a barrel of monkeys, a vehicle that will put a smile on the faces of its occupants every time it comes out of the garage. As noted in the Gooding & Company report I spent far too much time at Bonhams, wallowing in the antiques, Brass and Vintage cars. The reception for Bonhams “old crocks” is the definitive response to the demographic argument that these incredibly original and creative ways to solve the problem of powered transportation will age out of the market. No, the market will mature into recognition of their charm.